How many times have you had to leave your delicious meawl midway just to take a bawling baby outside? When you have to keep a close eye on your little mischievous troublemakers, eating out can sometimes be a chore. 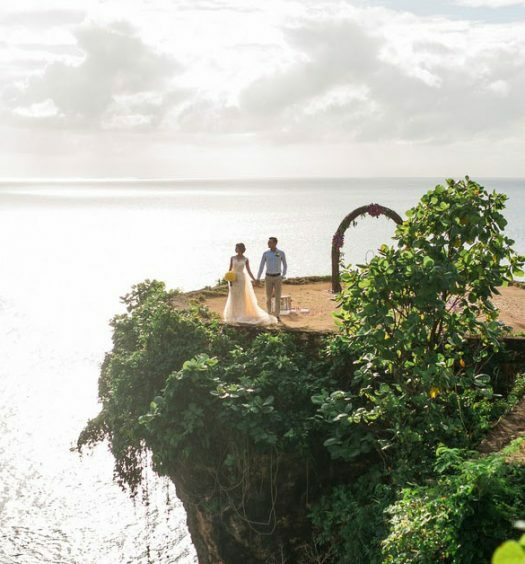 But, don’t let these potential problems put you off travelling! 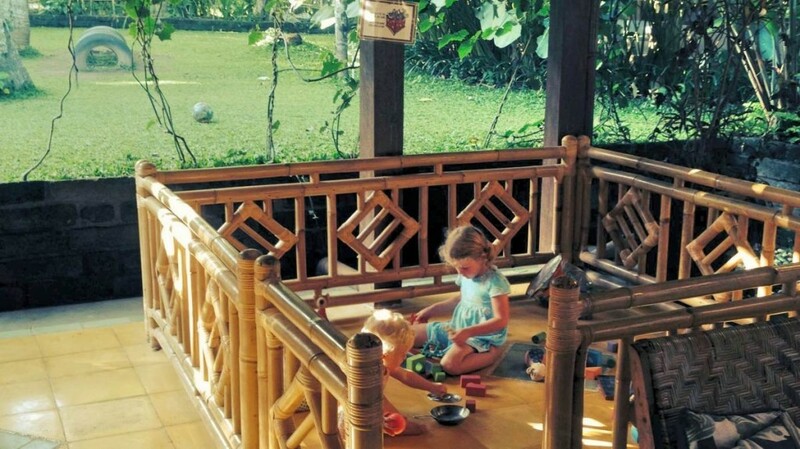 Sunny Bali can be a paradise not only for you, but for your kids as well, with family-friendly villas and even restaurants equipped to handle active toddlers. 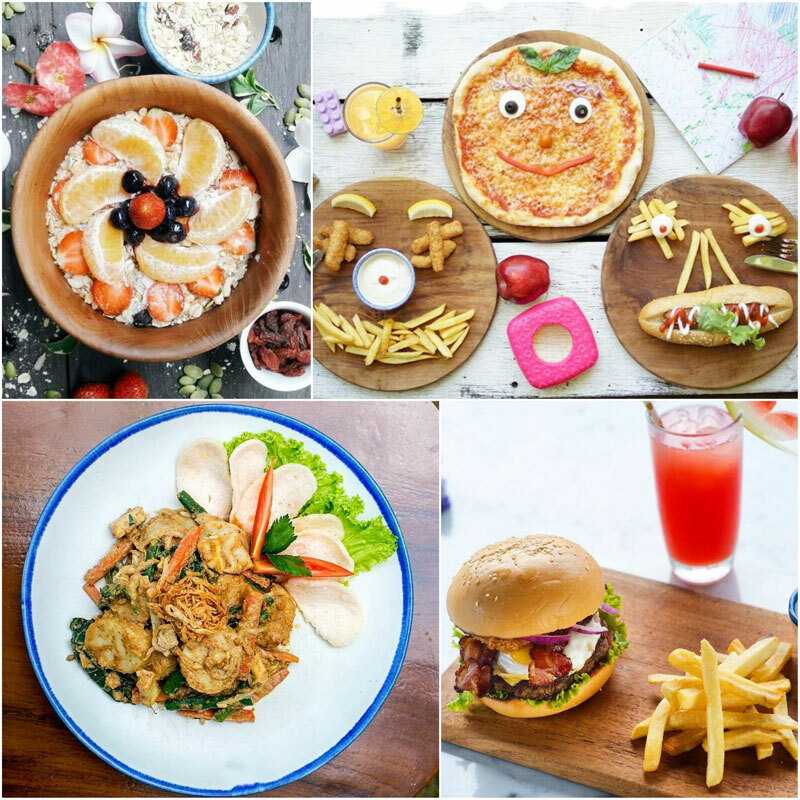 So at these kid-friendly restaurants, both you and your little ones will be able to enjoy an awesome meal together – and you won’t even have to break a sweat. 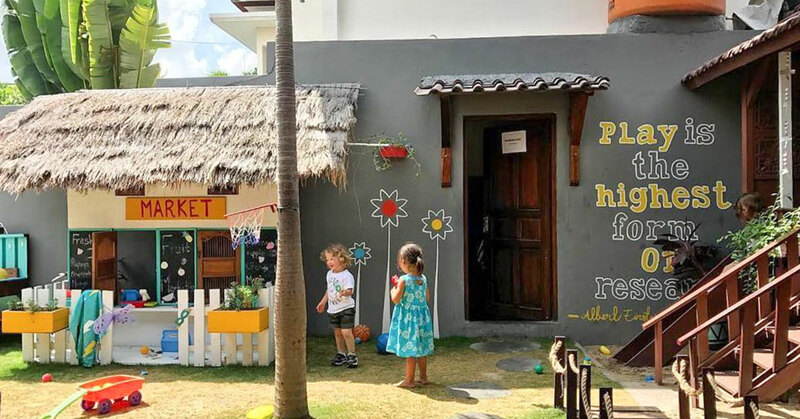 La Casita is one of Bali’s beloved eateries, with a lovely garden, rustic décor, and delicious menu of hearty Peruvian comfort foods that are bound to transport you to the other end of the world. 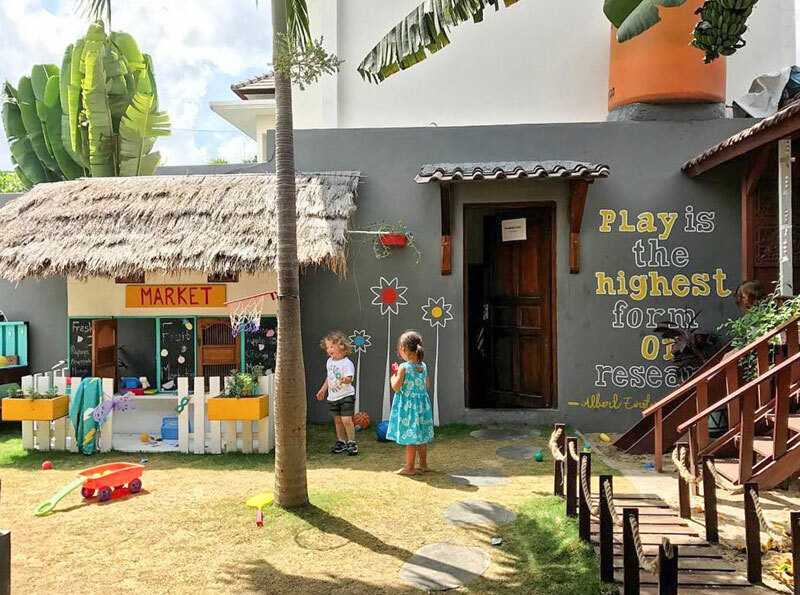 This also happens to be one of the island’s most kid-friendly restaurants – outdoor playground with a mini market for kids and many free activities daily for your little ones! 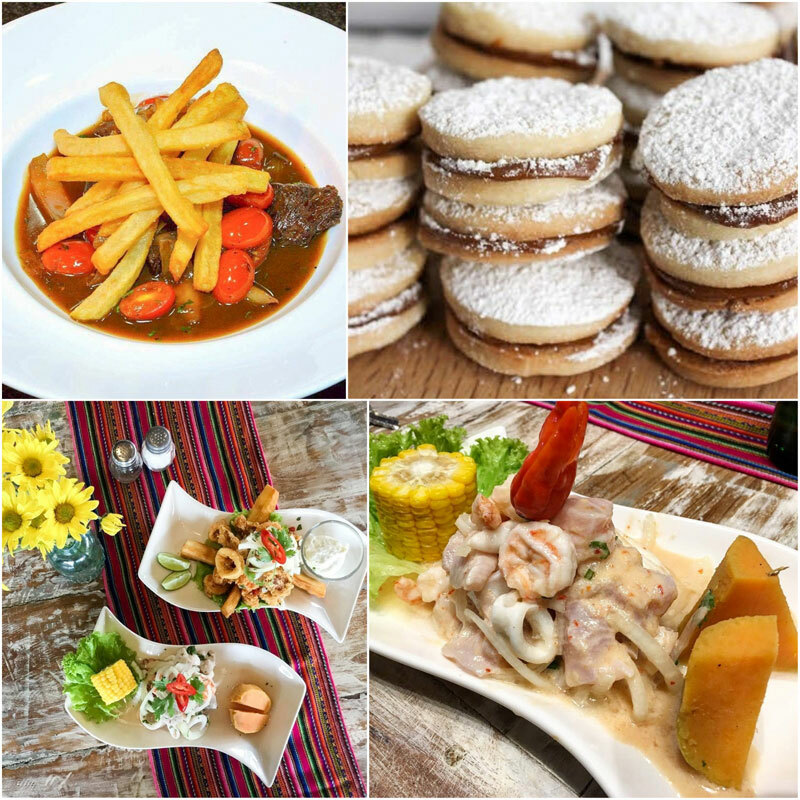 If you are not familiar with Peruvian food, it’s never too late to indulge in the restaurants specialities. One word on what you should expect – colourful! 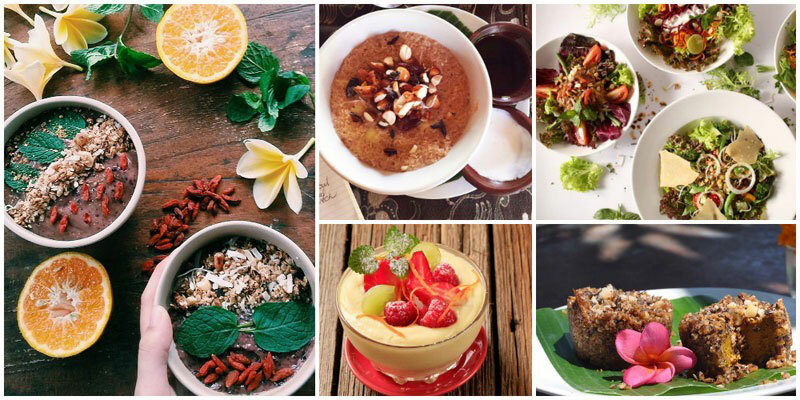 Another one would be – flavourful! One of their must-tries is the traditional confectionery Alfajores (Peruvian cookies). They are soft, delicate, crumbly and tender with a creamy touch of Dulce de Leche on the inside – ideal at tea time while the kids get all rowdy running around the playground. 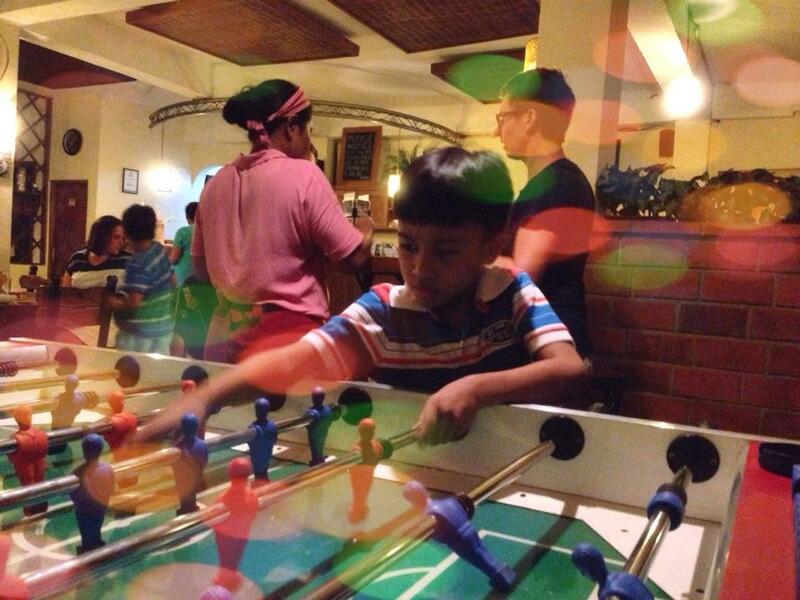 Combine family fun with great food at Berawa’s Kitchen. 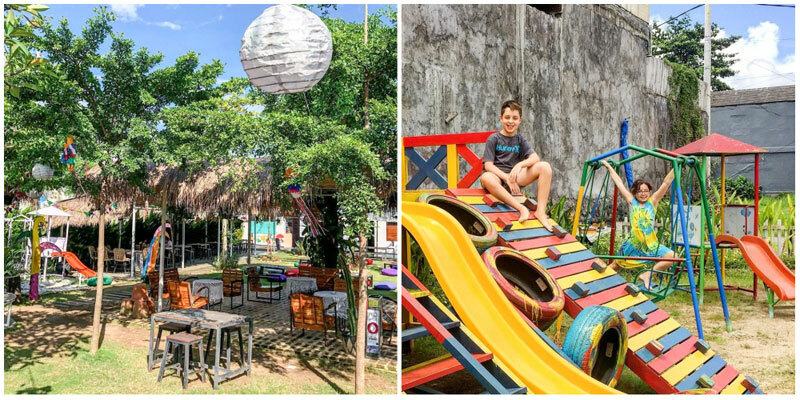 This hip restaurant located in trendy Canggu overlooks its own private playground, so you can tuck into a burger while keeping a watchful eye on your kids as they have a go at the jungle gym. 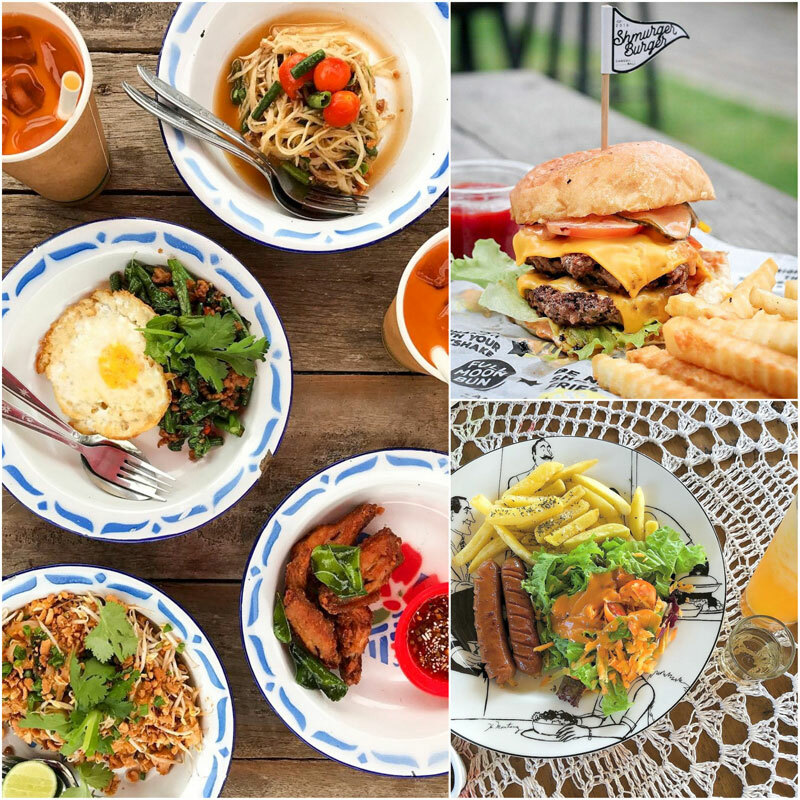 The menu is full of refined Western and Indonesian favourites and surely super child-friendly but the ambience is what’s really catchy – nothing stuffy, so come without shoes if you like and let your kids run loose in the playground! 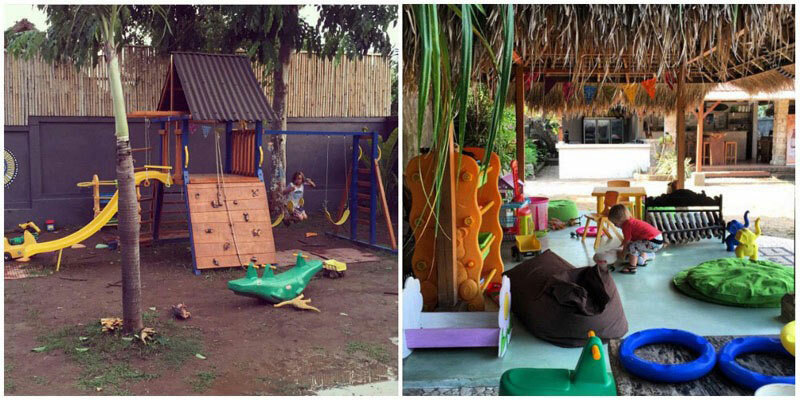 We know that space is of utmost importance when you have kids, and Berawa’s Kitchen delivers plenty as it is set upon a well-manicured lawn. The open dining area has lots of room for strollers and scampering tots. 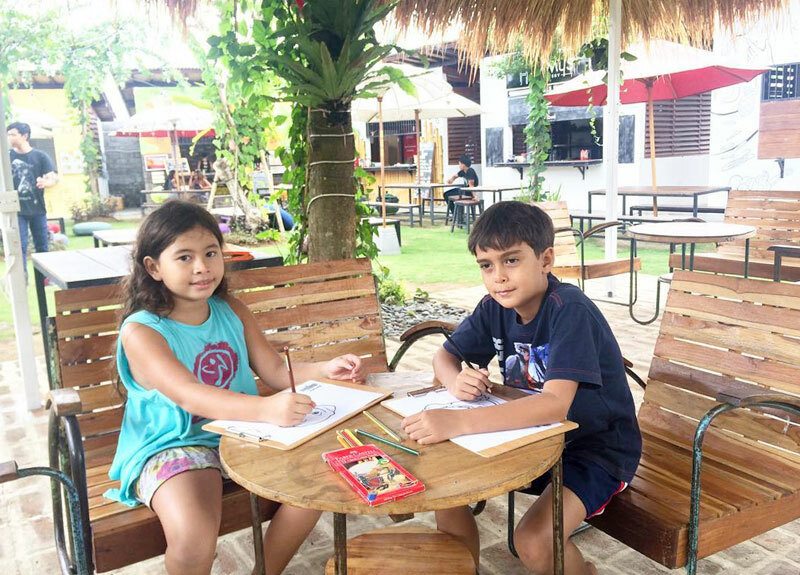 For your little artists, colouring pages are also available at the restaurant so they can get creative and distracted (mean to say but truth needs to be told)! P.S. 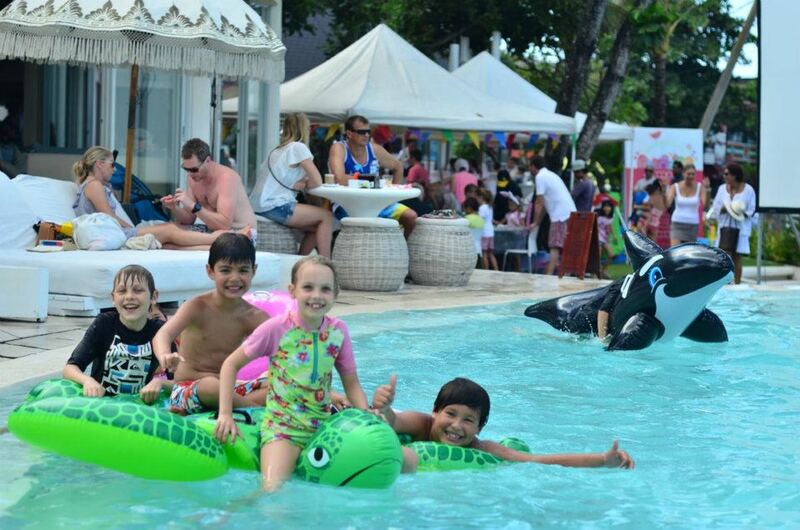 Don’t miss the live music on Tuesdays, Thursdays and Saturdays, and a jumping castle for the kids on Fridays from 5pm! For years, parents with kids across the world have been struggling to find solutions for Friday night dates while on vacay… Where do we leave the kids? With who? What will they do? What will they eat? 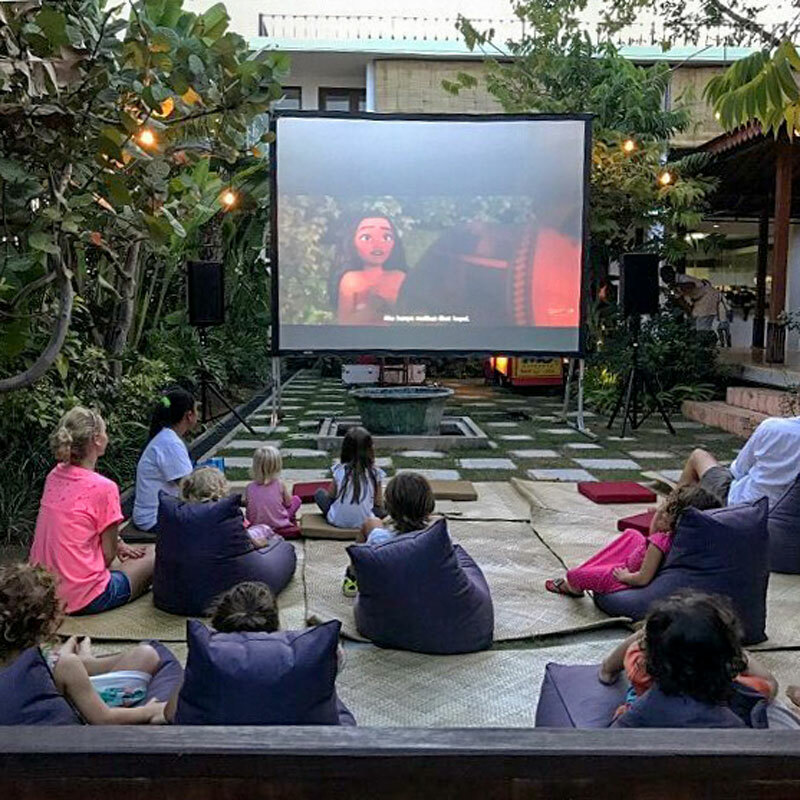 Well, problem solved in Bali as The Joglo holds Friday Night Kids Movie Club. Come for your date night with the little ones and set them on one of the multiple bean bags for an ultimate outdoor cinema experience with popcorn and fruit punch at an affordable price. 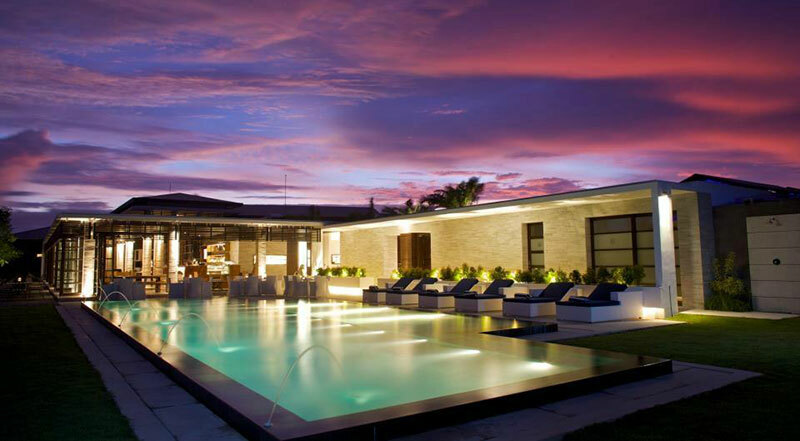 You won’t be disturbed while you escape indoors with your partner and dig into small plates of Indonesian delicacies paired with cocktails and iced cold beers. 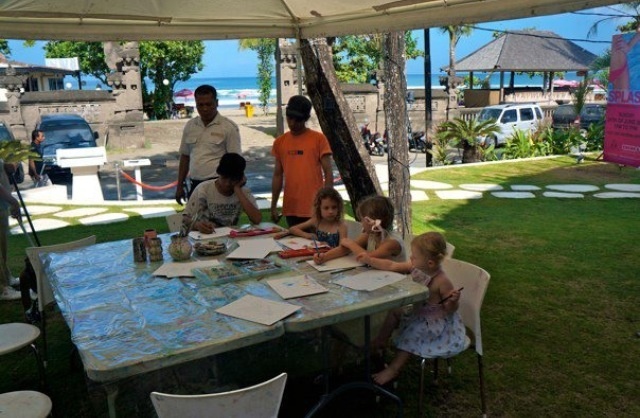 The Joglo also welcomes kids with open arms on weekdays – afternoons are dedicated to arts and crafts workshops. 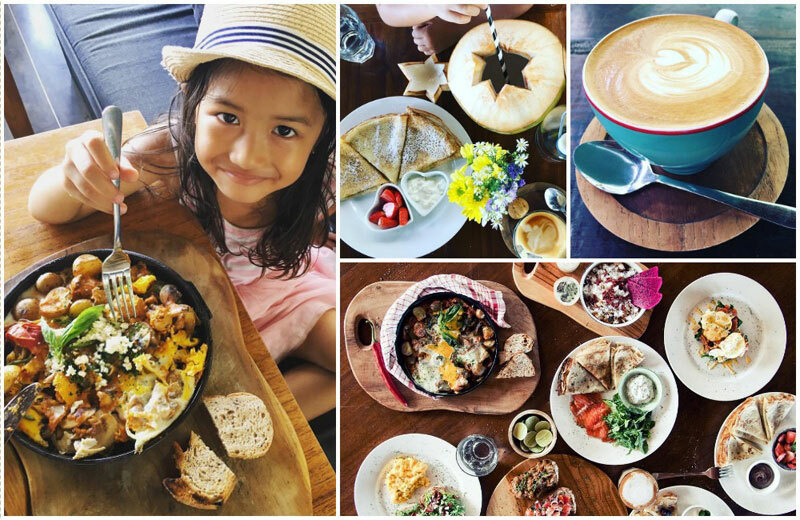 On Sundays, you get to enjoy a relaxing brunch al fresco style while your kiddies soak up the sun as the restaurant boasts an outdoor playground with swings, slides and rolling green lawns. Need more to persuade you to drop by? The restaurant has a “too cute to eat” menu and kids eat free of charge at breakfast time throughout the week! Parents’ steal! 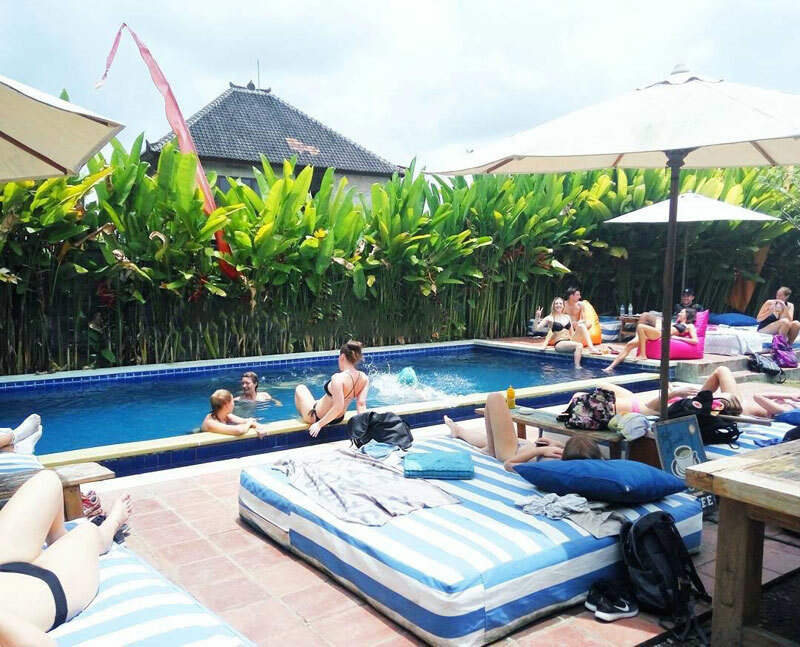 Alam De Ubud is a happy and colorful place where families can spend the whole day relaxing in the sun, on the colorfull beanbags, swimming (yes, they have a pool!) and drinking fresh juices. 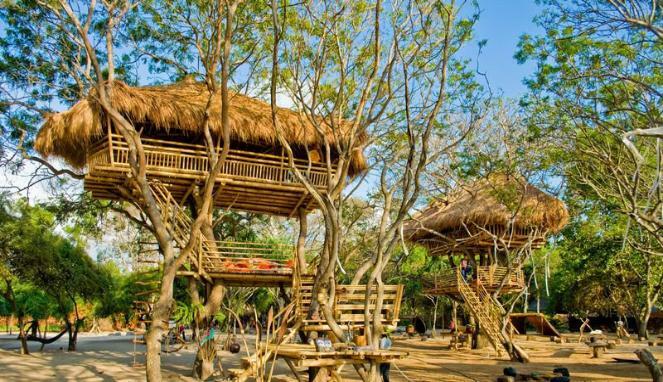 You can gaze at the rice paddies and snooze in the hammocks while safely letting your kids run around on the manicured lawn or have some good old fun on the swings. Getting too hot? 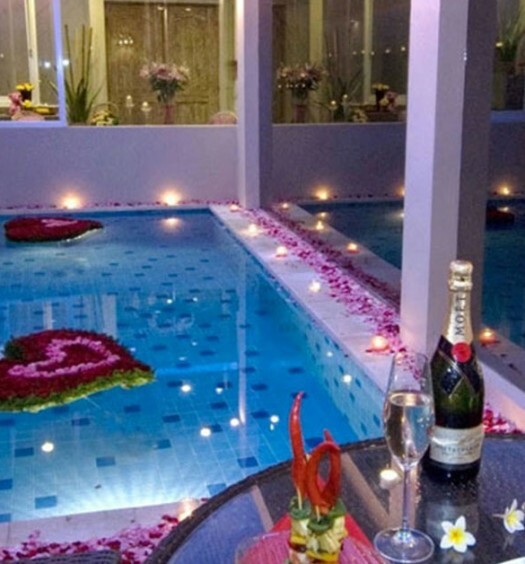 Splash into the refreshing pool together! 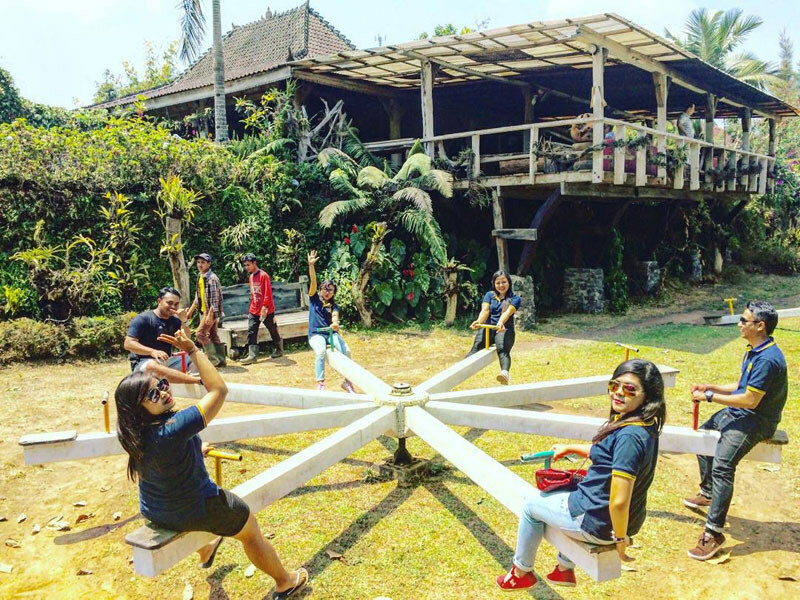 Alam De Ubud is also a great place to watch the sunset, and when you can see the stars, the place transforms into a cozy hang-out spot with lots of colorful lights. 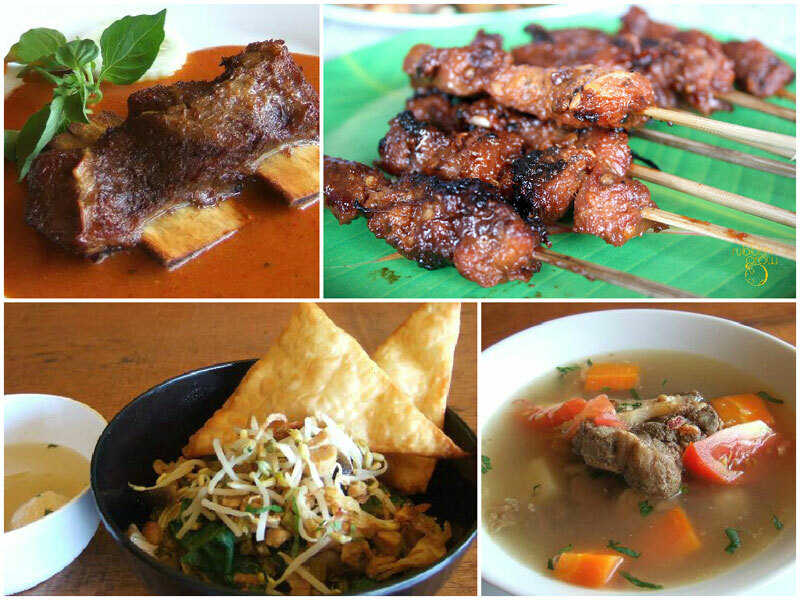 For dinner, try the traditional Indonesian Nasi Campur, or for the hungry Daddies among us, go for a plate of ribs. 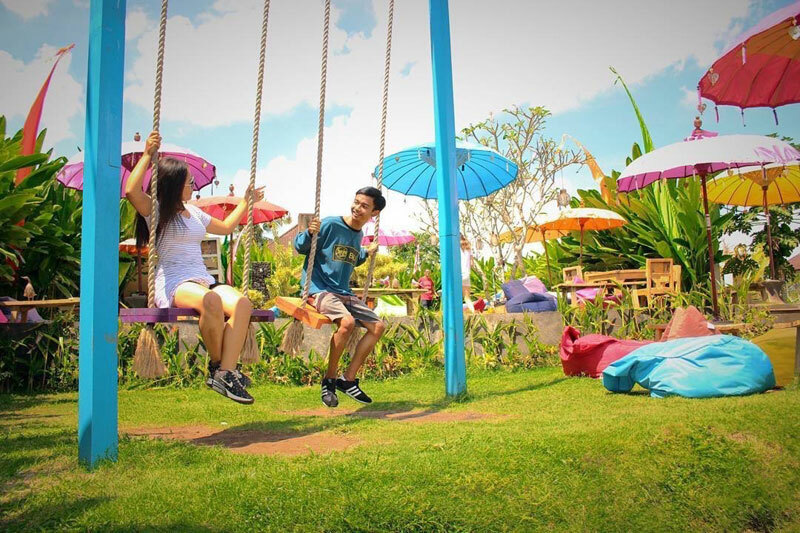 Not only does Cinta Cafe serve excellent breakfast, lunch and dinner with an amazing rice paddy view, but it also features an actual on-site playground, making it a little kiddie heaven. 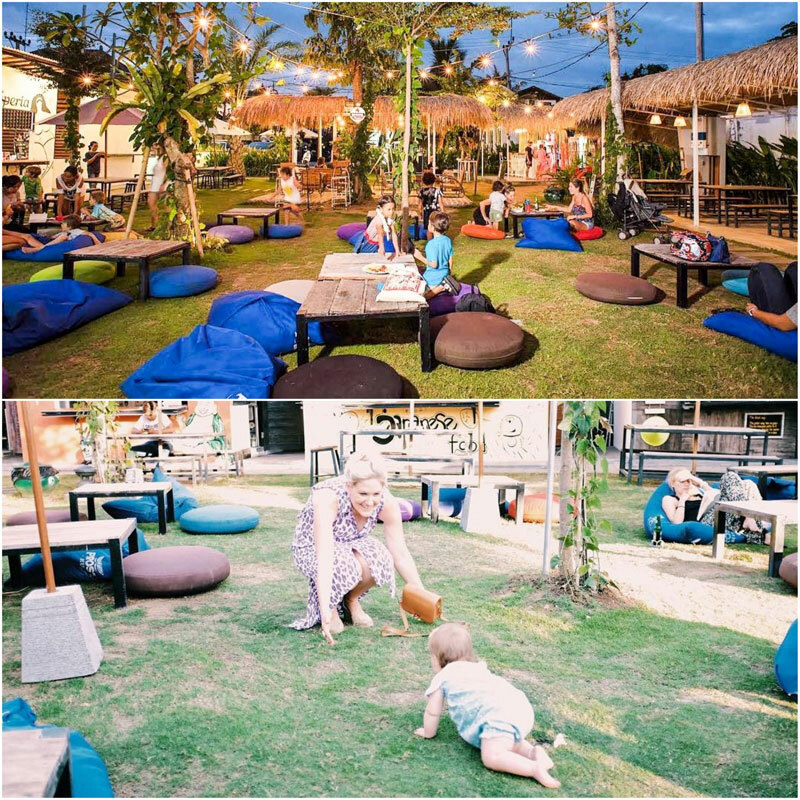 While the little ones can slide and play for hours while, you can watch them from a distance while enjoy quality time with your partner, sipping a good old cup of coffee and trying out several delights from the menu. 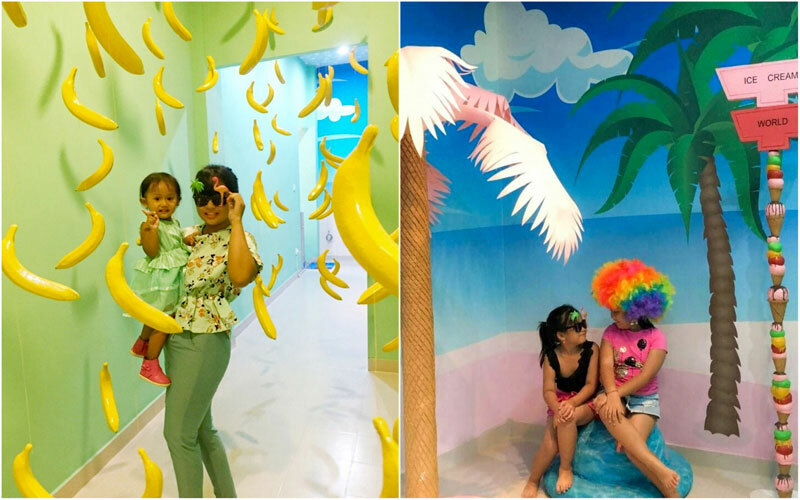 Every Sunday, Cinta Cafe organises special activities for kids, so it’s the perfect family day out! 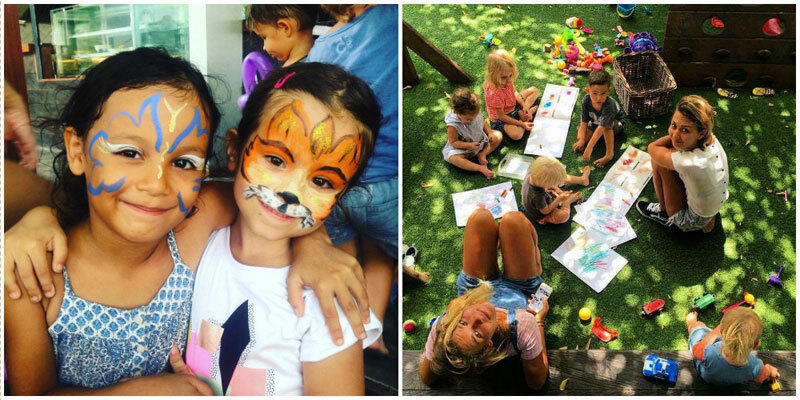 Get your kids over between 4 to 6 pm to thrill them with face painting, balloons and guided activities. They will love it and so will you. In the meantime, you can enjoy a good glass of wine or a happy hour draft beer. 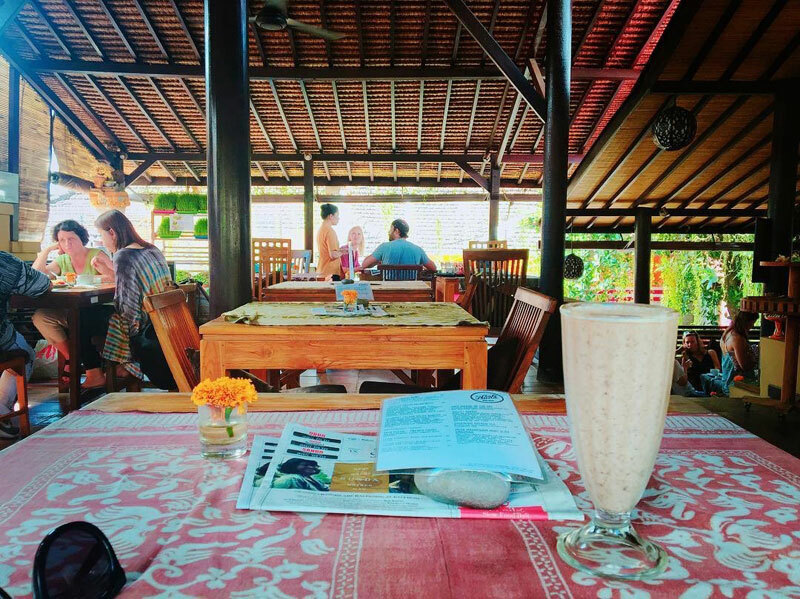 If you’re in Bedugul, it’s a given that you should dine at a place that gives you a view that lives up to Bedugul’s picturesque reputation. 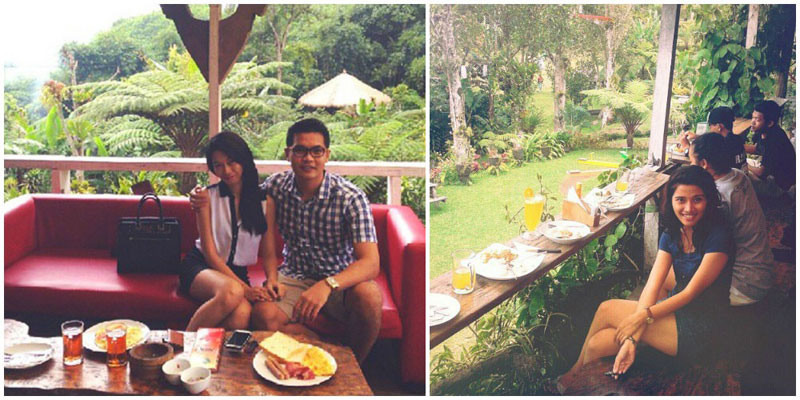 This is where Warung Rekreasi comes in with its stunning views of the mountain and the lake. First, fill up with food like betutu and grilled chicken (we hear these are delicious! 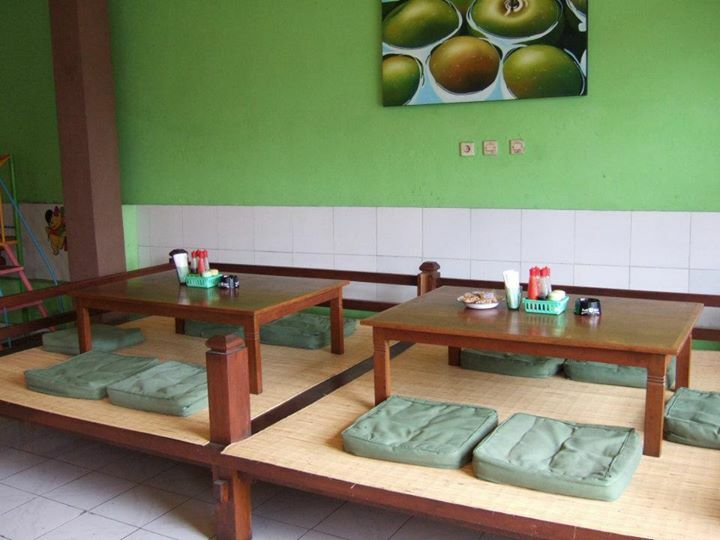 ), and then wander around the restaurant/hotel complex to check out other activities you may do. 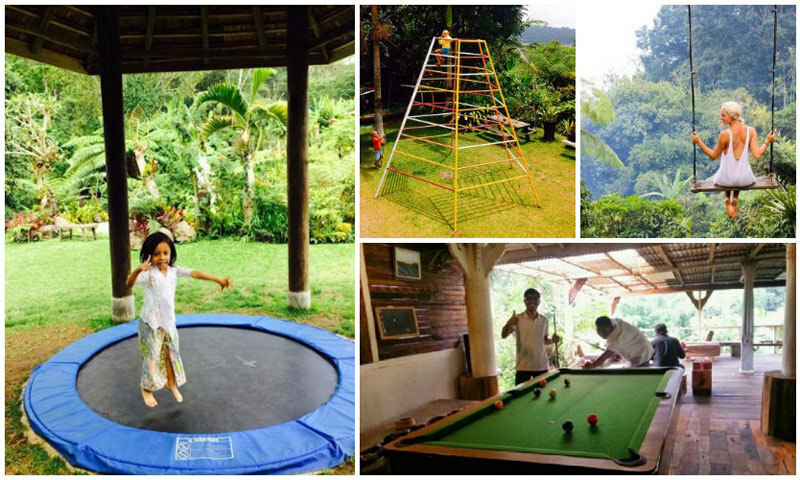 There’s a playground for the kids, and orchid garden and organic farms, a coffee plantation, and even a bamboo forest where you will definitely take photos at, and more! 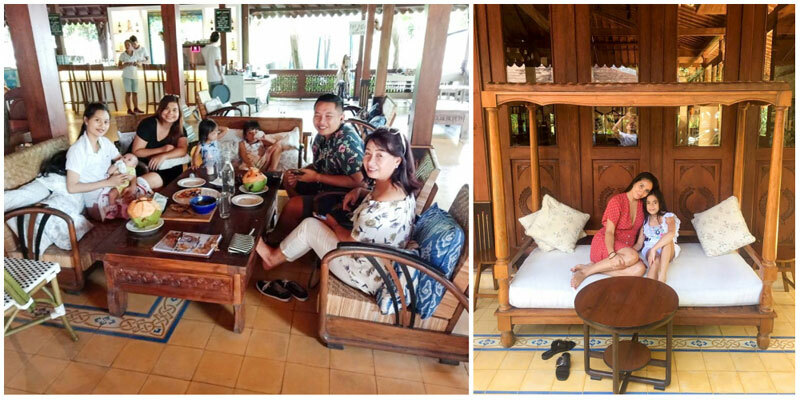 Dining at Warung Rekreasi is something like an all-in-one experience where you get to not only eat, but take in the stunning views, and hop along to other activities too. 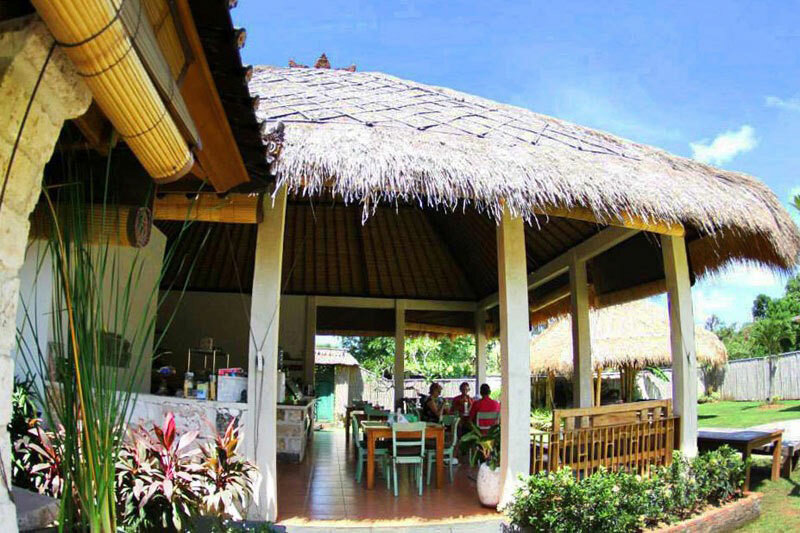 Hidden away at the southern tip of Bali near Bingin Beach awaits a little family paradise – The Cashew Tree. 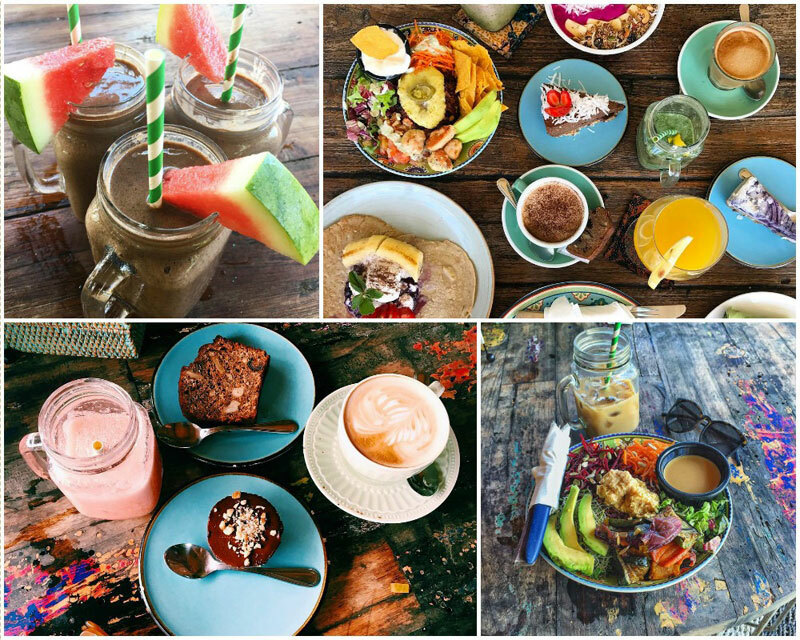 This cafe serves mouthwatering colourful food to thrill any food lover. Even the cakes are a dream come true for parents as they are not only delicious, but also healthy! 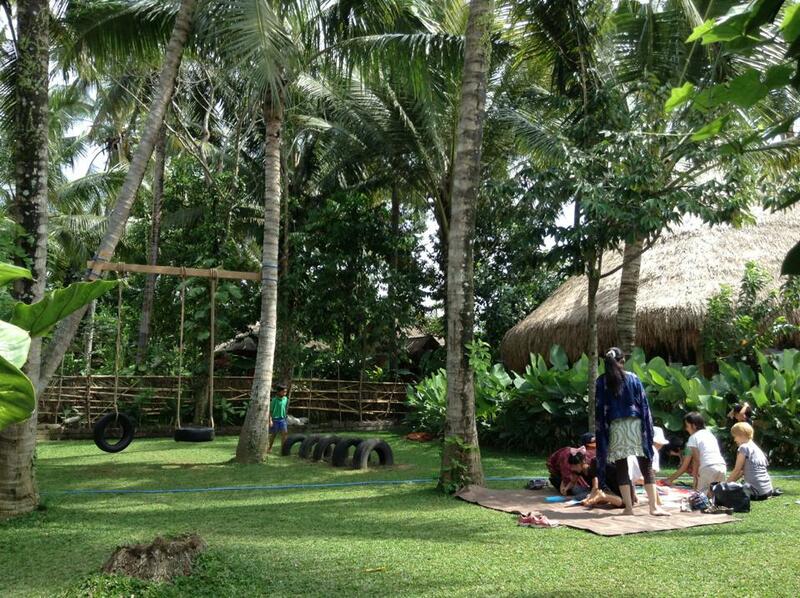 While the kids slide and swing happily at the playground, you can practise yoga. The kids might even want to join in! The family dog is also welcome here too. 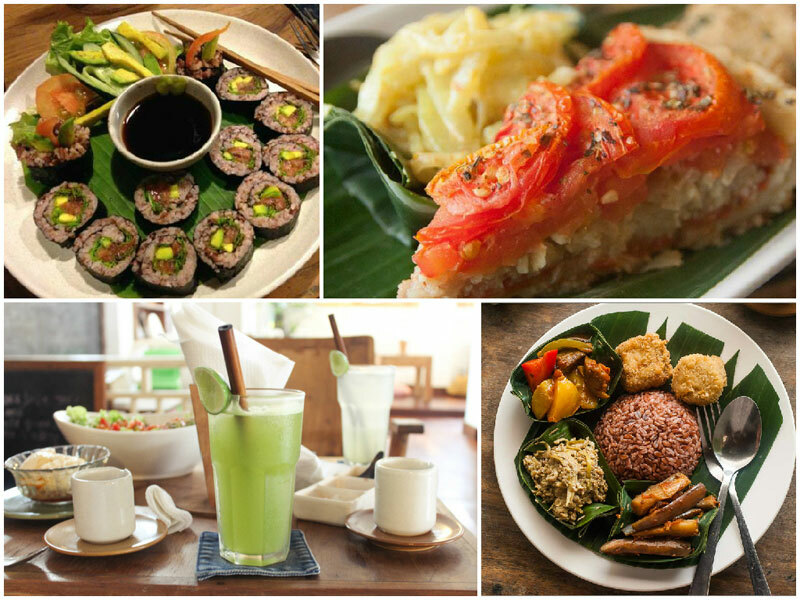 Bali Buda is the place to go for healthy, organic food and drinks. Treat yourself and your kids to a raw chocolate treat with healthy goji berries and nuts to go with your cappuccino or a healthy homemade lemonade for the kids. 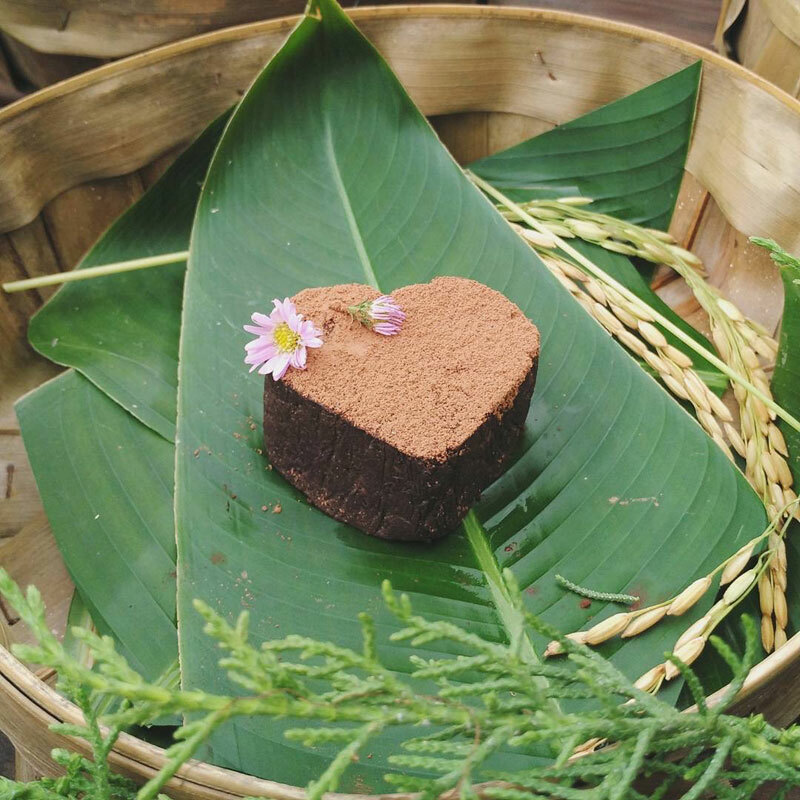 How about a raw chocolate heart to share with your loved ones? You can come here for breakfast, lunch and dinner. 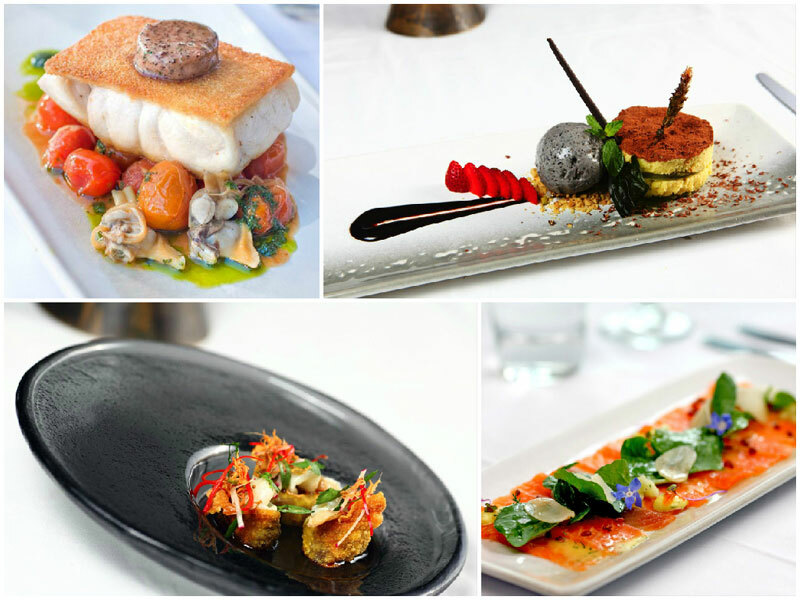 Their menu is extensive, portions are generous and everything is delicious! 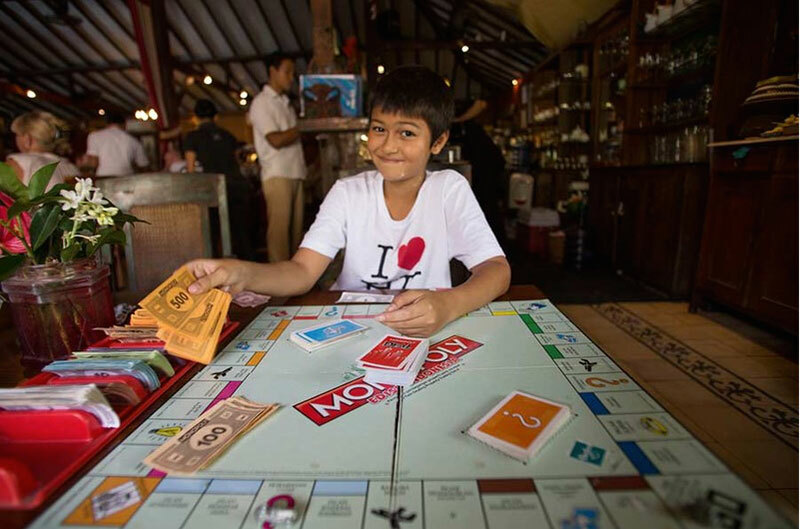 Their Ubud branch comes with an enclosed playground for the kids, complete with books, crayons and wooden toys, making it a perfect family cafe where you can spend more than just a bit of time. 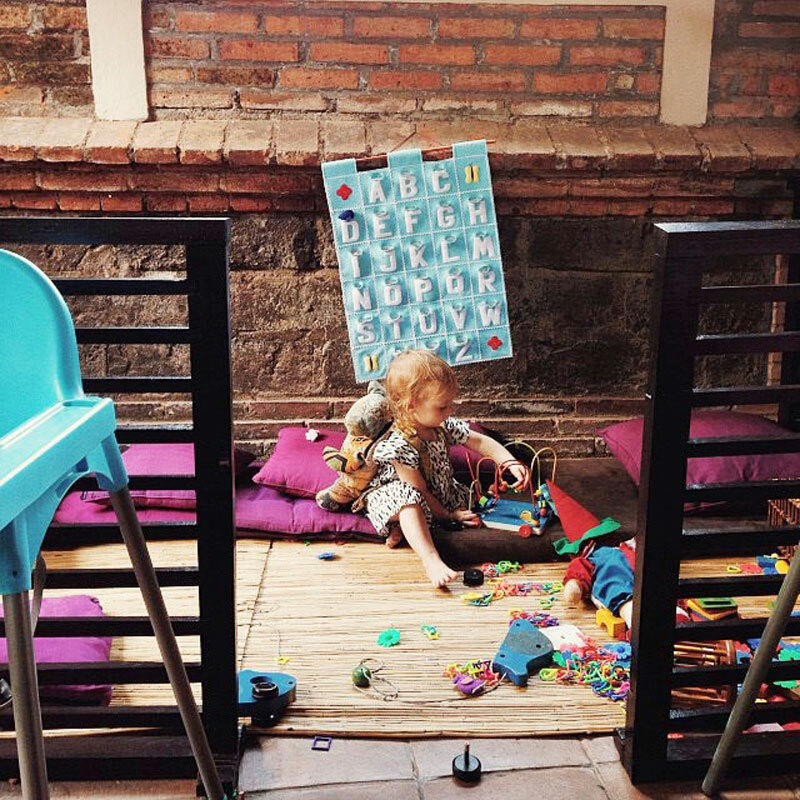 Both kids and parents will love the treehouse mezzanine where you can lounge on comfy colorful beanbags, enjoying fresh air and yummy treats. 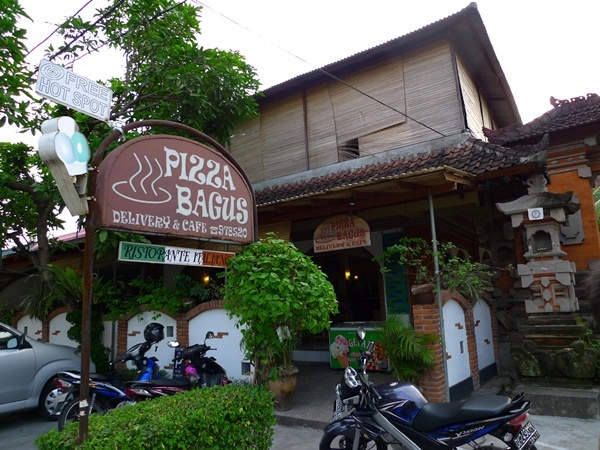 Bali Buda also has other branches in Bukit, Sanur, Kerobokan and Munggu. 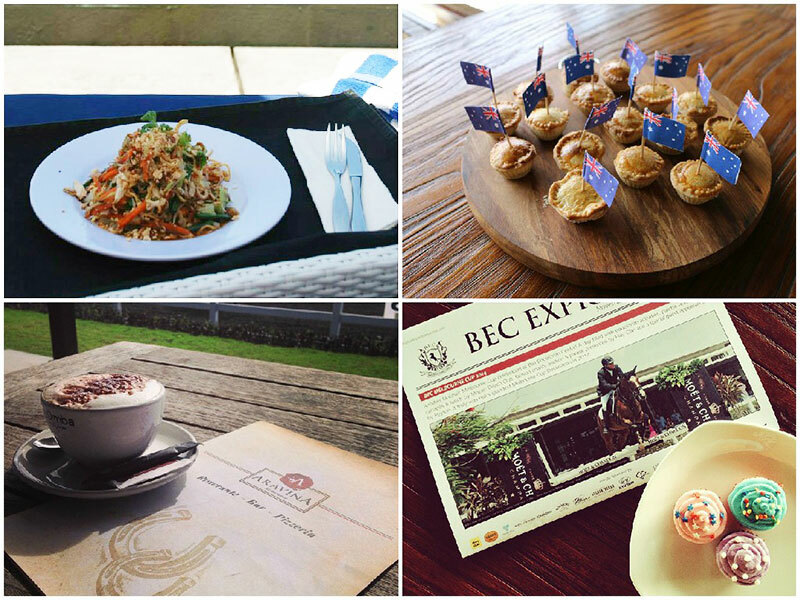 Whether your kid is prepping to be a Horse Whisperer or just wants to have some fun in the sun, they’ll surely enjoy the BEC Café, located within the Bali Equestrian Centre at Canggu. 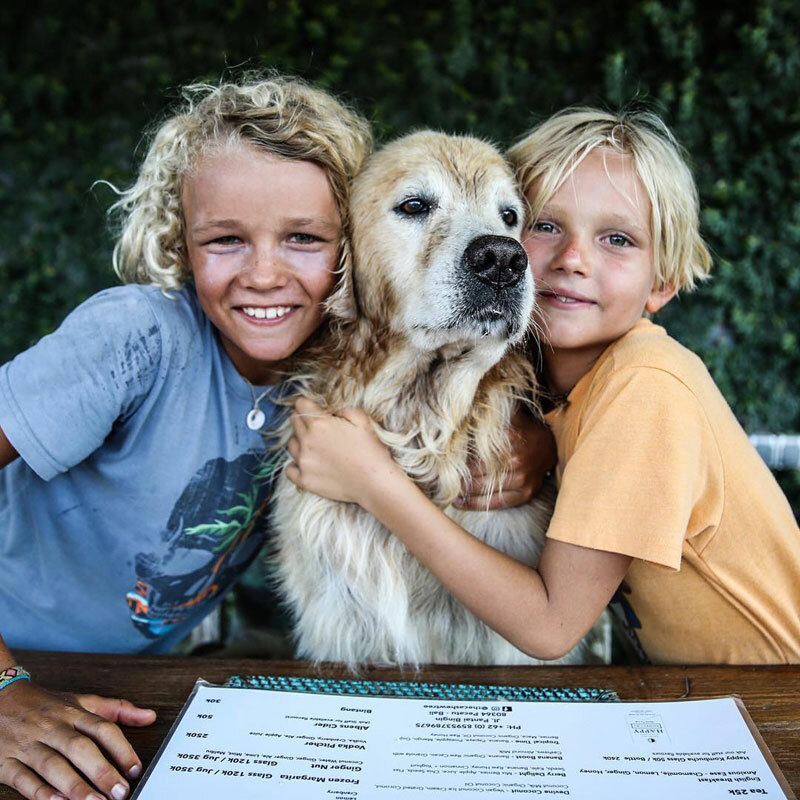 Your little animal lovers will be delighted at the pony rides available, and if that’s not their thing, the premises are also equipped with a wide variety of toys and play areas – a sandpit, cubby house, swings – you name it. There’s also a TV room where you can keep the kids quiet and content with a movie, and a swimming pool right beside the restaurant, so your child will always be in your line of sight. 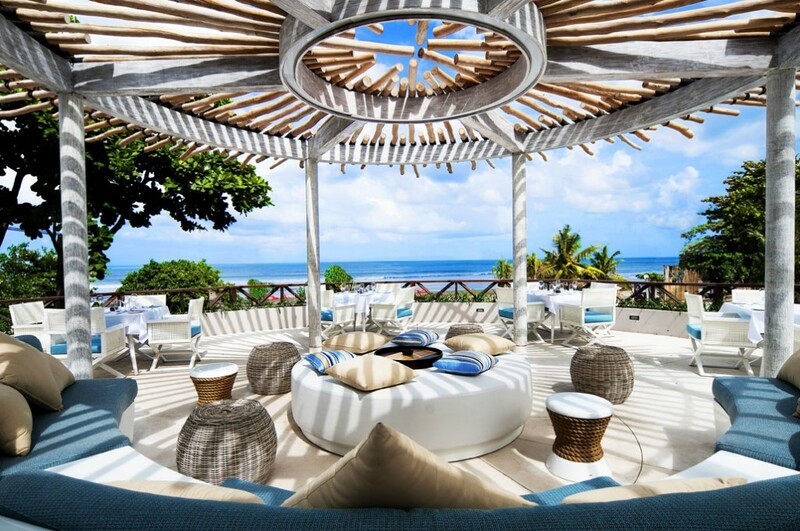 Imagine sipping at a glass of wine leisurely and digging into one of the restaurant’s popular sunset platters as you watch your children have the time of their lives – doesn’t that sound like a great outing already? 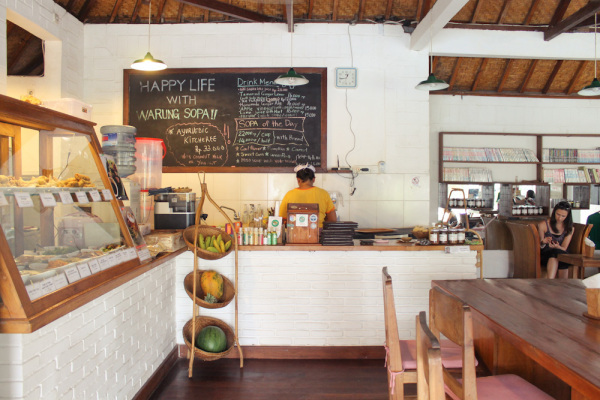 For kids who love the outdoors, Warung Sopa is an ideal location for lunch out on a sunny day. 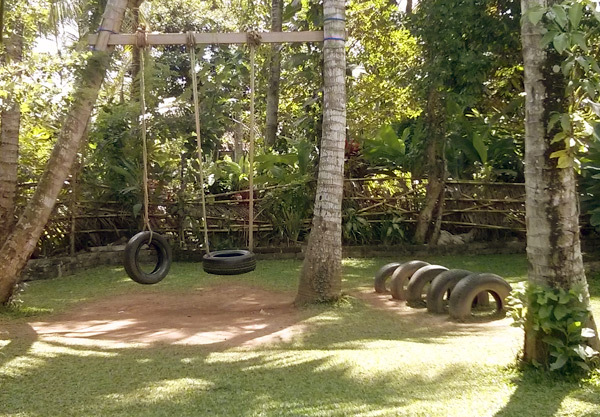 You get a large play area for the older kids, even equipped with tire swings. For your young toddlers, you’d want to an eye on them – and you can do just that. 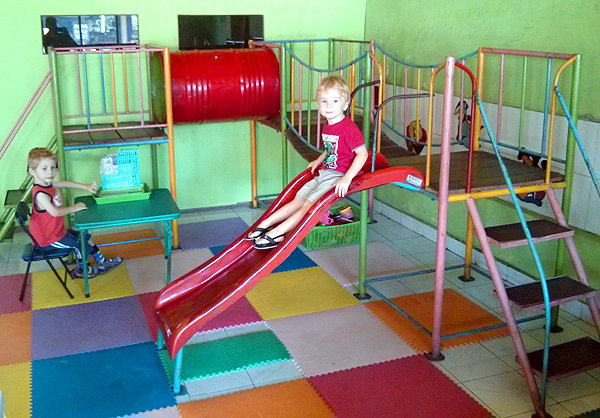 Warung Sopa has a small, cosy fenced playpen filled with toys for small children. So they’ll be able to tinker around while still staying in absolute safety, and you can relax as you wolf down your lunch. 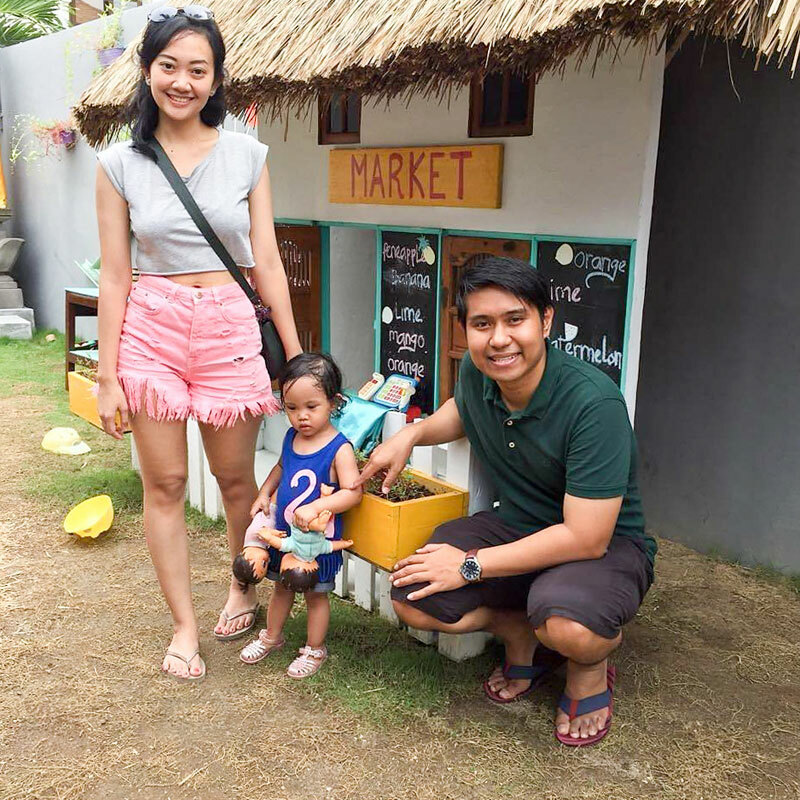 The restaurant also serves up Japanese-Indonesian fusion vegetarian food that’s not only tasty, but healthy as well, so your kids get the best of both worlds! 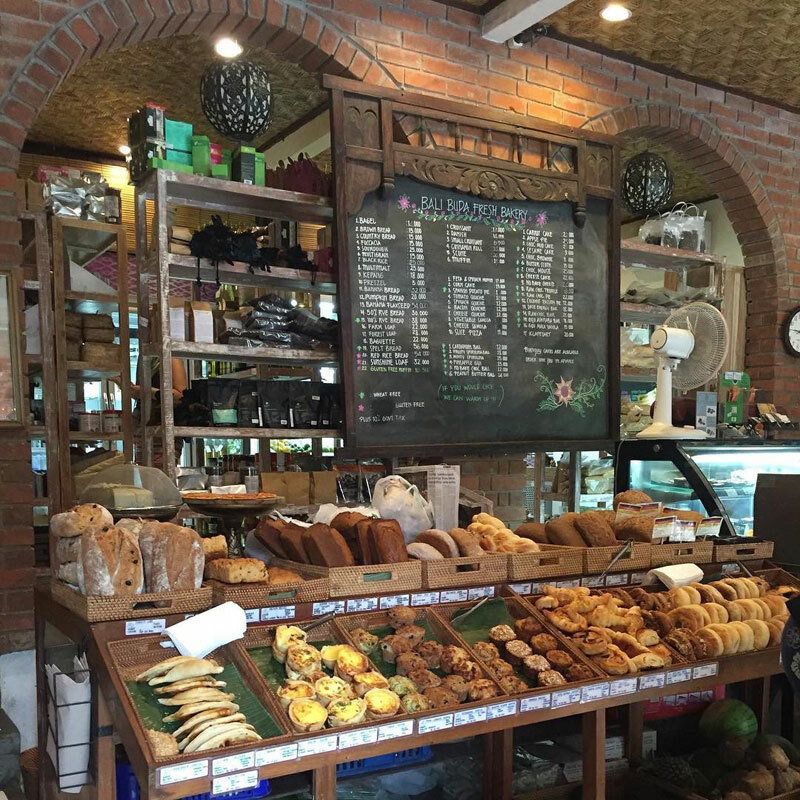 If you ever drop by, make sure you don’t leave without first trying out the restaurant’s much-raved-about Nasi Campur and vegan pies. 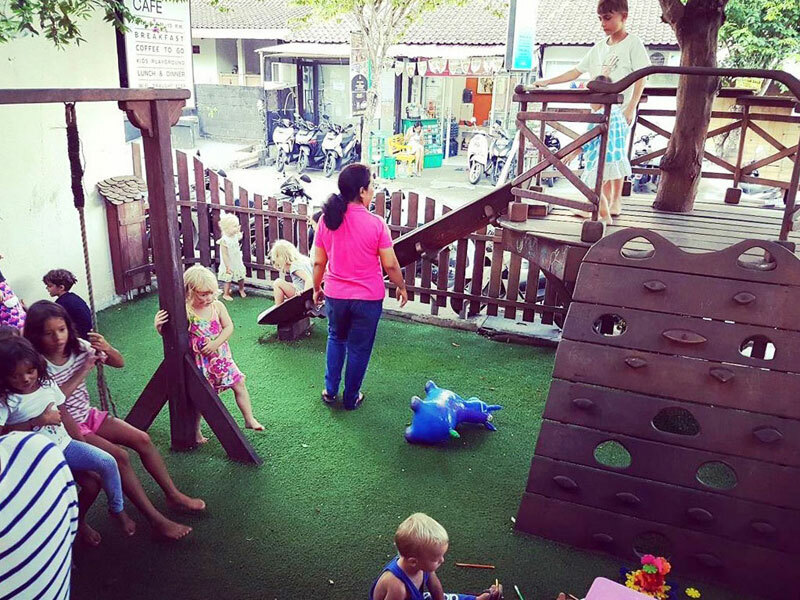 Warung Hana is a heaven for children – with a rainbow-coloured indoor playground, a box of toys, and a matted floor to cushion any fall. And it’s not just only about the little ones. 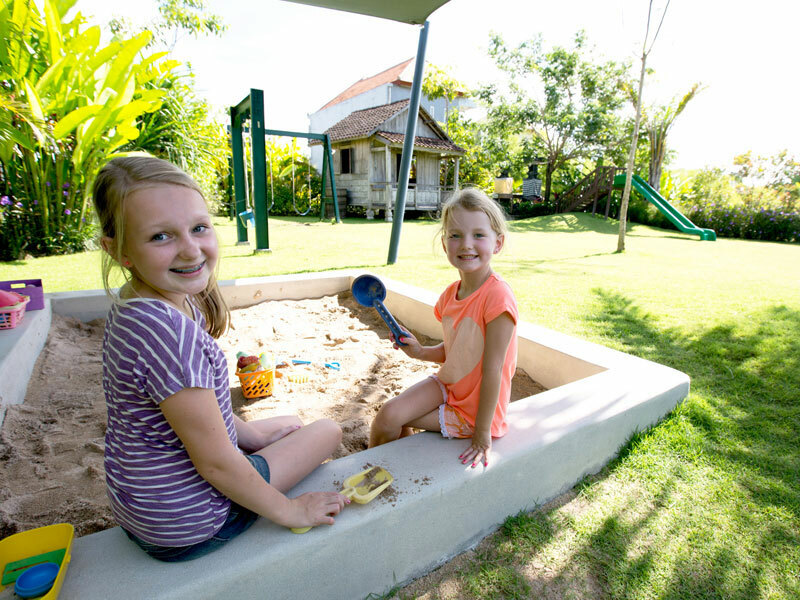 On a quieter second floor, hidden away from the clamour at the playground, parents can enjoy some time to themselves – do try out the fried calamari and goat curry stew! 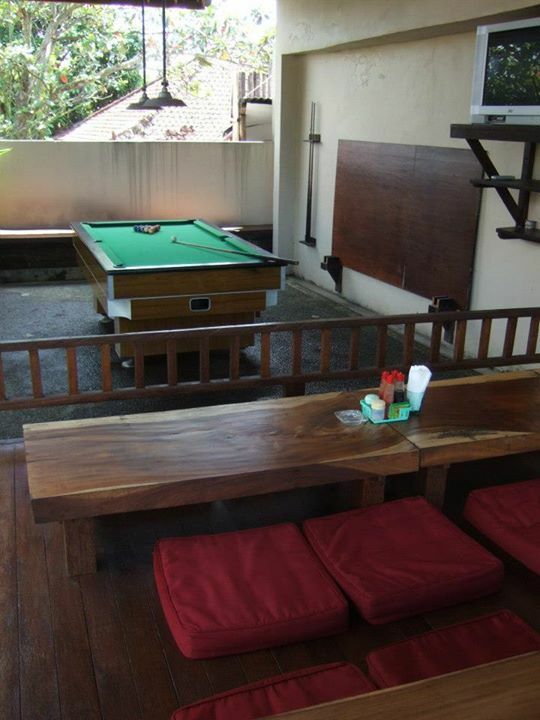 – and even play a game at the pool table. 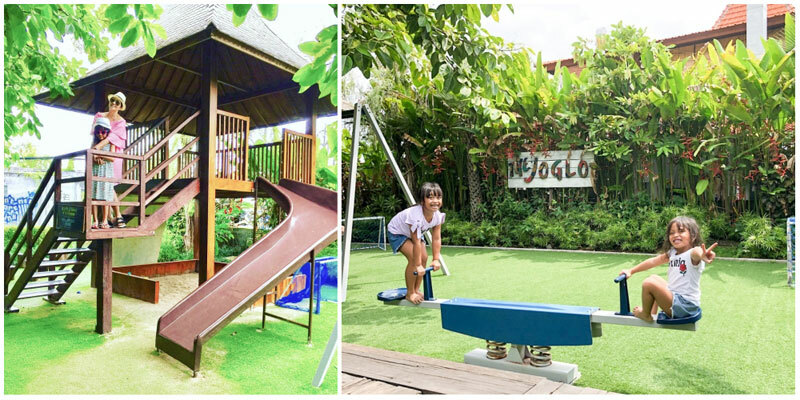 It’s a place where you and your kids can have fun at the same time – almost too good to be true. 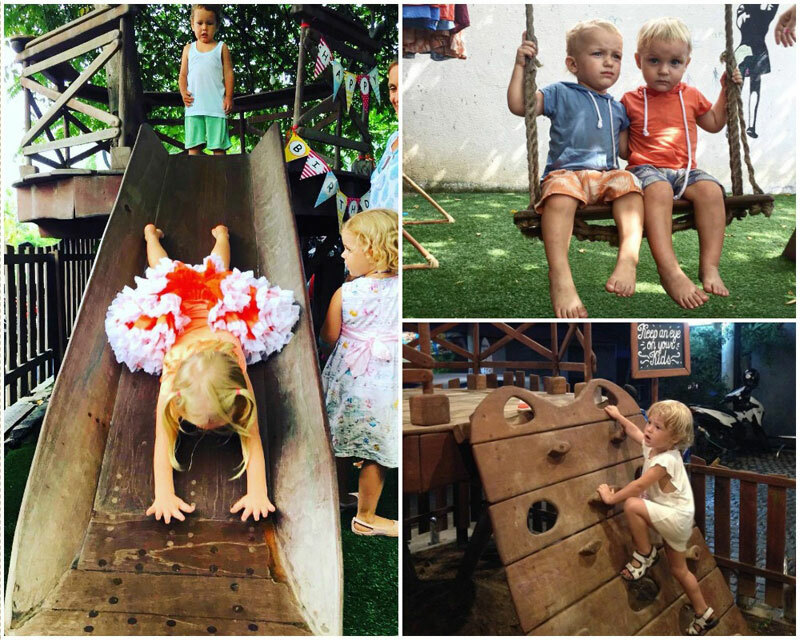 If you’re after a slightly more unique experience for your kids, The Pirates Bay is a once-in-a-lifetime experience of eating in a treehouse and being a pirate for a day. 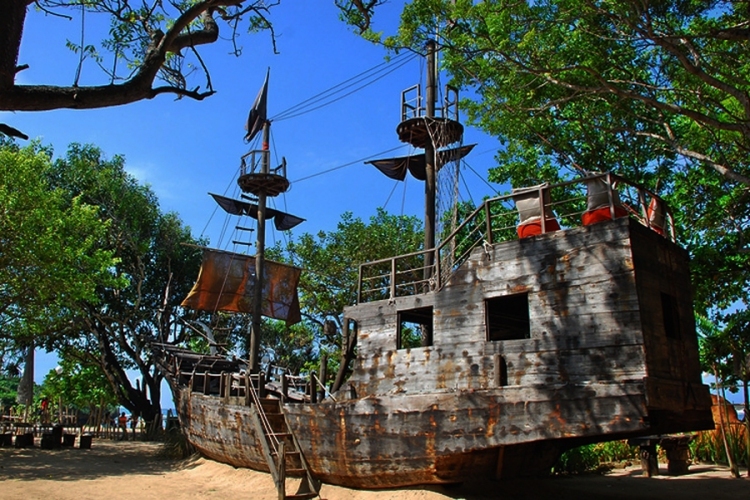 That’s right, they’ll no longer scream and run around or pretend to climb a tree as though it’s the mast of a ship. 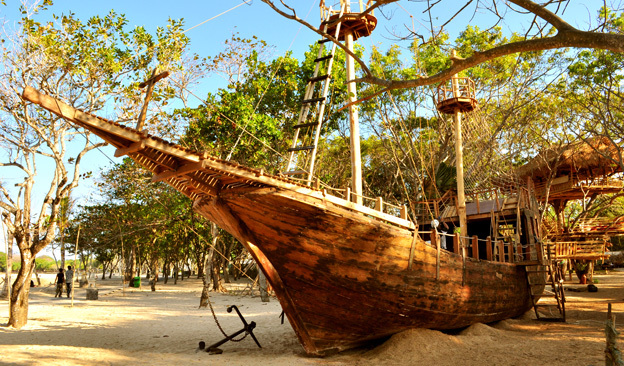 Located just off the Nusa Dua beach, The Pirate Bay’s authentic-looking pirate ship and treehouses will definitely awe the little ones. 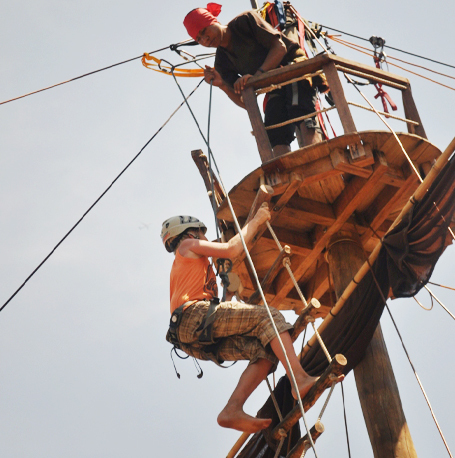 They’ll even be able to try out various activities such as pirate games, swings and ropes. 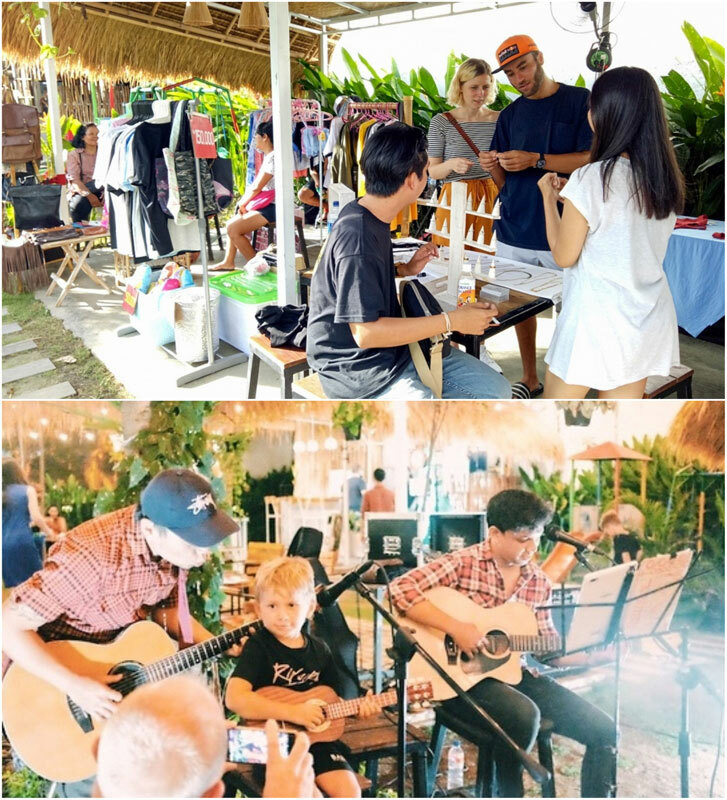 Meanwhile, you’ll be able to go for a quick swim at the nearby beach and enjoy your meal in peace for once – other happy parents have satisfied their taste buds with special dishes like the fried banana with cheese and grilled tuna. 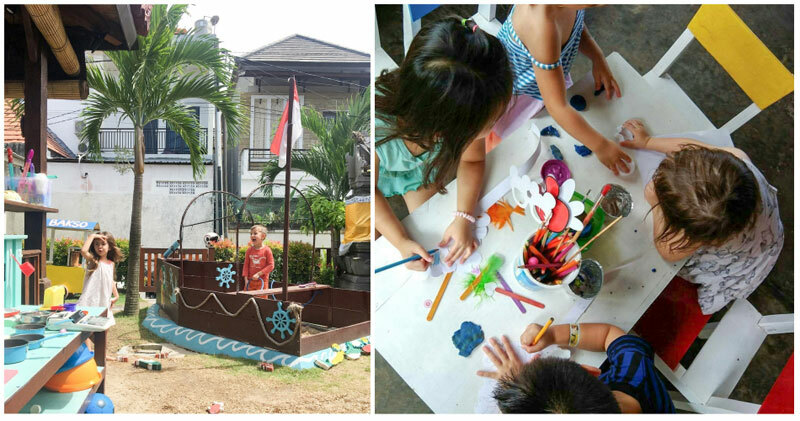 Imagine listening to your child’s euphoric “ahoy!” as you dig into your sumptuous meal and down a cup of ice cold juice on a sweltering hot day. Doesn’t that sound simply idyllic? What do you do if you have a wailing baby and a rebellious teen? Who would you rather placate? Well, you won’t have to make that choice, because Pizza Bagus is capable of solving that problem for you. Besides selling affordable and yummy pizza – which kid doesn’t love pizza? 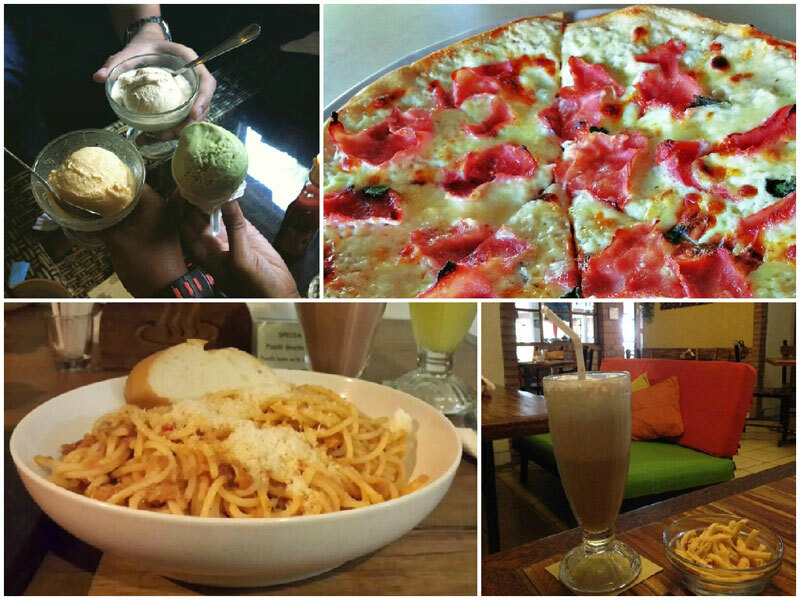 – and drool-worthy spaghetti carbonara, the restaurant also has different tricks to cater to children from different age groups. 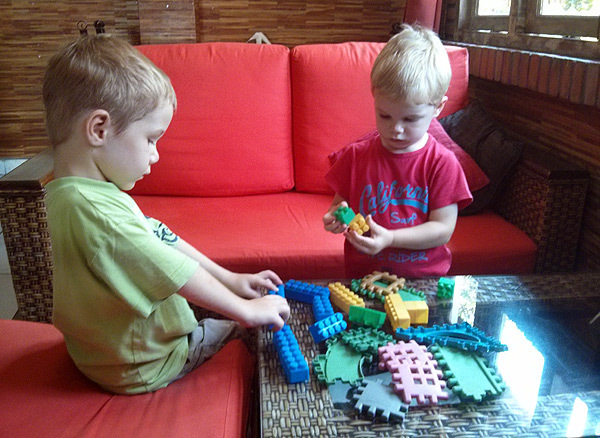 For the younger ones, playing blocks, paper and crayon are provided for them to keep themselves occupied. As for the older ones, they can challenge their dart-throwing skills on a dartboard or play futsal with the other kids at the restaurant. 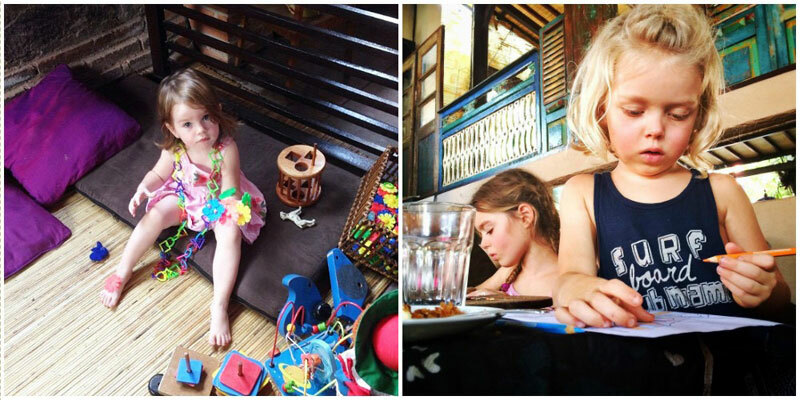 So at the end of the day, your children are bound to have a bagus (which means “good” in Bahasa Indonesia) time. 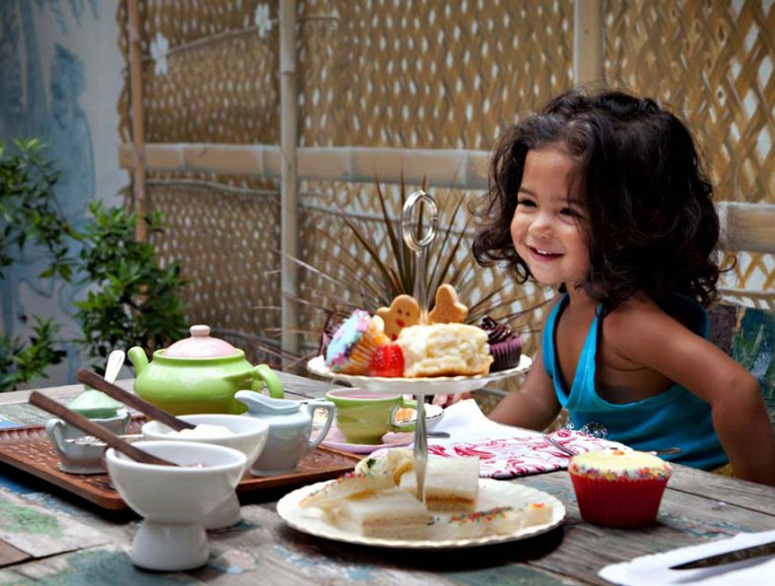 High tea is no longer only for the adults at Biku, where your children can try out the real thing for themselves. The kids’ high tea set is presented on a classy three-tiered plate, just like the adult version. 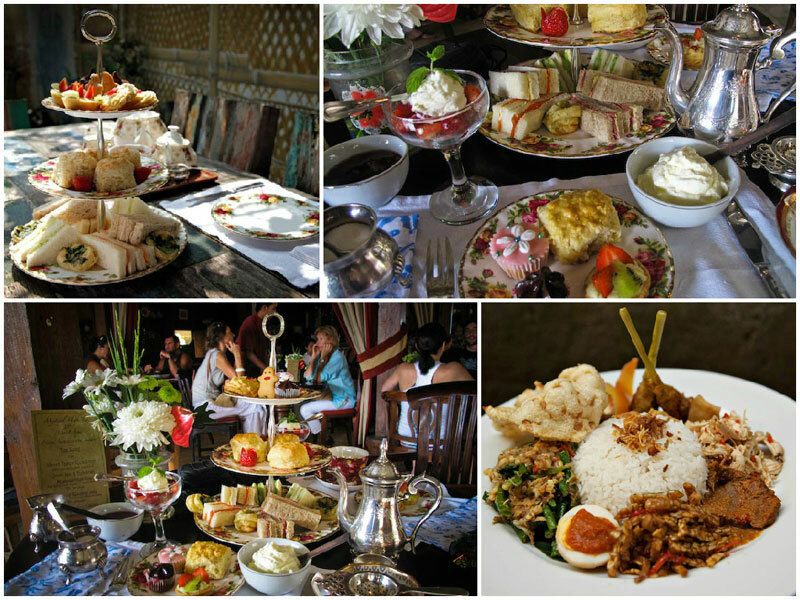 The only difference – they get cute miniature versions of the snacks, with delicious cakes and scones stacked up high. 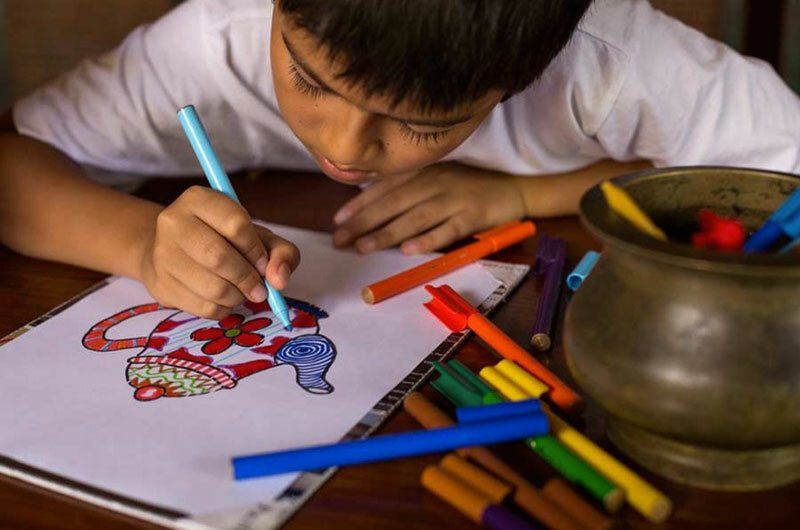 And when they’re tired of stuffing themselves, you can request for games and colouring books to keep the little ones occupied, while you scour Biku’s well-stocked bookshop for a good read to bring home. 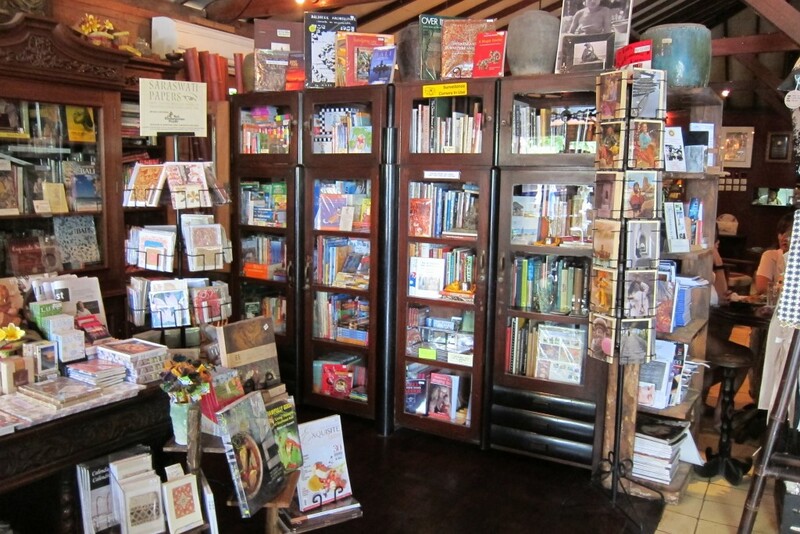 You can even buy some children’s books about Bali for the kids, just to remind them of the awesome experience. 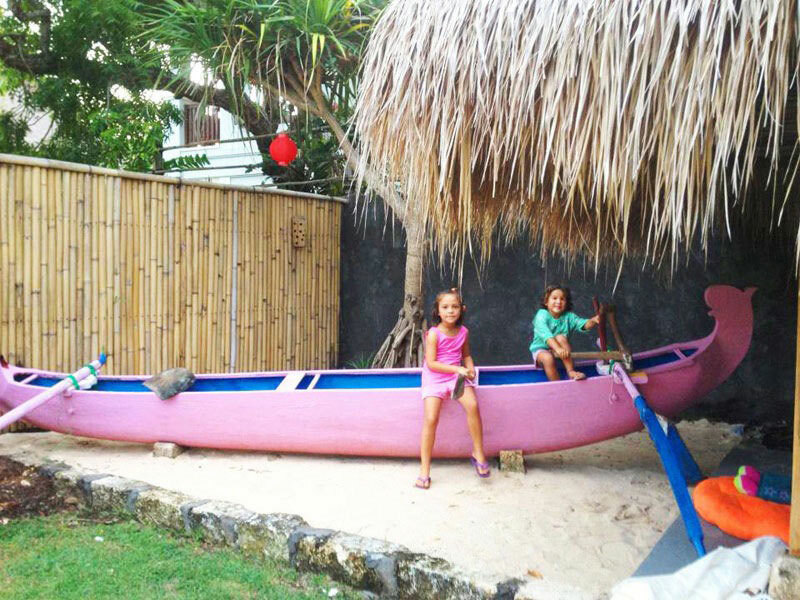 For water-loving kids, Cocoon Restaurant and Beach Club is a dream come true. 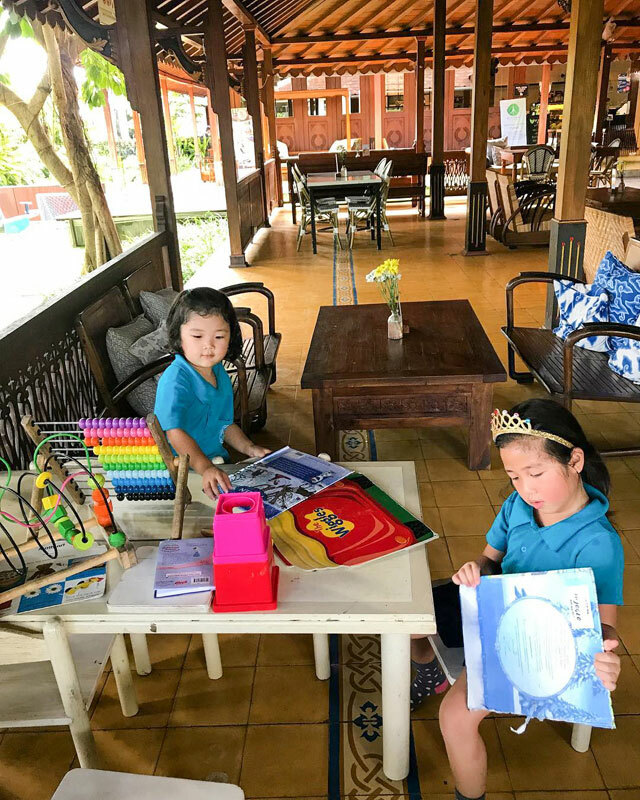 The restaurant is located right next to a pool with an entertainment area, and there’s even a special “Cocoon Kids Sunday”, when your kid can make fun crafts and swim, under the watchful eye of a lifeguard. So what else is there to fear? 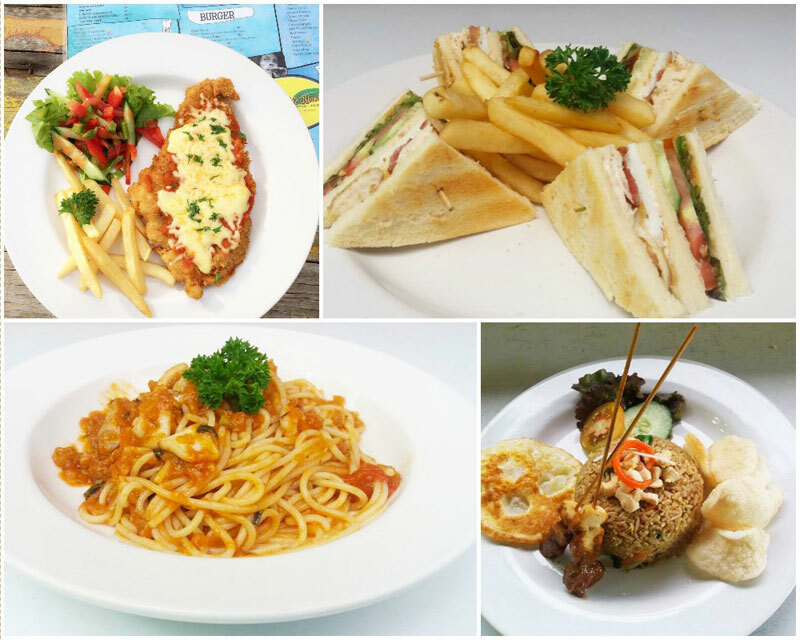 All you need to do is to sit back and enjoy Cocoon’s extensive menu of delicious pasta, pancakes and many more yummies! The kids’ menu also features popular bites such as the homemade gnocchi and grilled fish. Price range: Mains from Rp. 35,000 – Rp. 190,000 (Approximately USD $2.68 – 4.94); Drinks from Rp. 30,000 – Rp. 250,000 (Approximately USD $1.41 – $2.82). Where do we even begin? 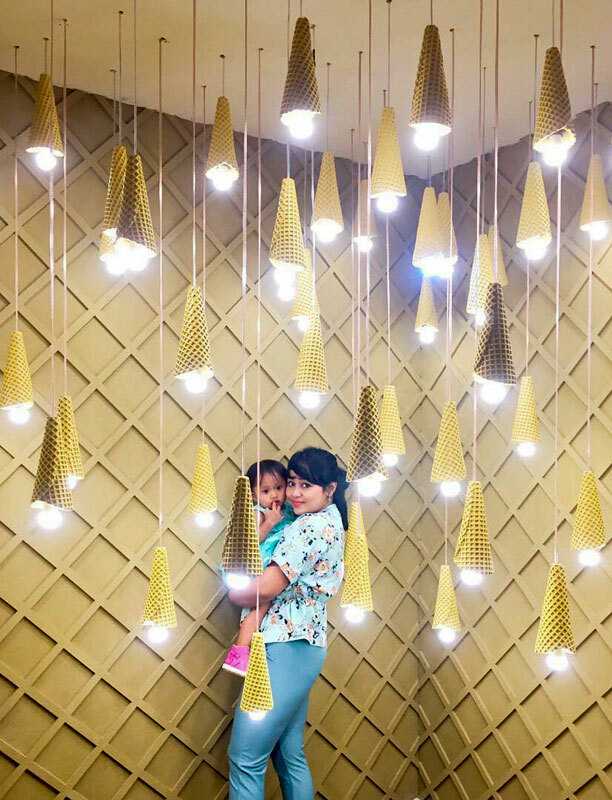 Past the simple flavors of vanilla, strawberry and chocolate, this unusual ice cream shop in Bali is an interesting stop for dessert time! 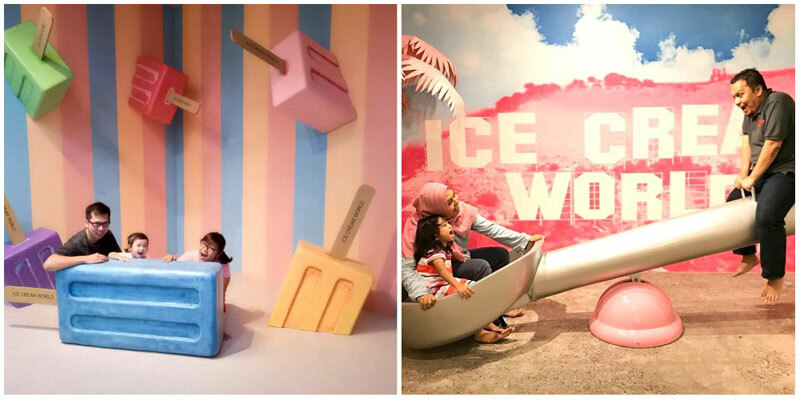 Ice Cream World is packed with cute and Instagrammable interiors that are fun for kids to hang out at and play for hours – swings, sprinkle pits and much more! 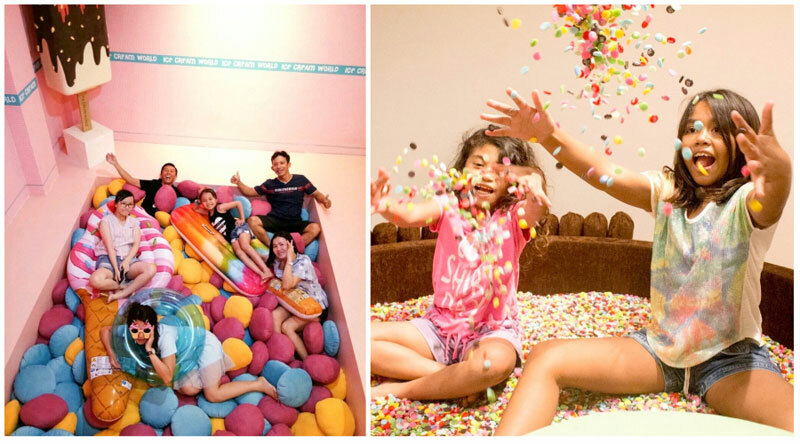 The place is set to transform the traditional come-in-and-sit kind of ice cream shops – it is undeniably a gallery of contemporary fun artsy exhibitions to have fun and pose with. 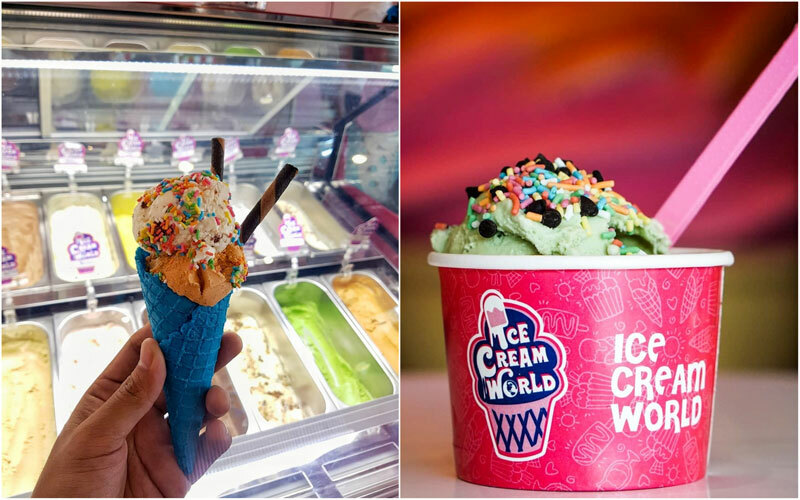 Ice Cream World serves ice cream guilt-free and you can judge by its serving – they know you will burn them calories by jumping into the cool pillow and sprinkle pits after your sweet treat! 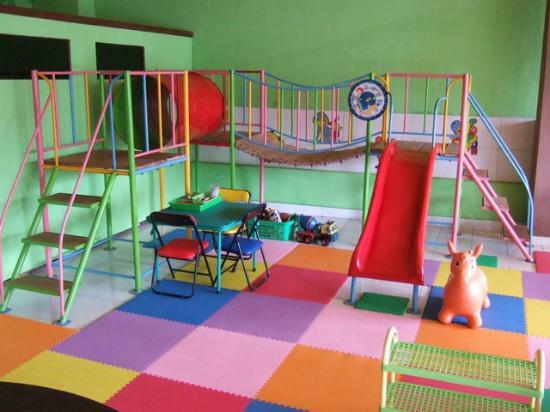 Its bright and colourful interior is appealing to anyone, especially kids and us – the young-at-heart! 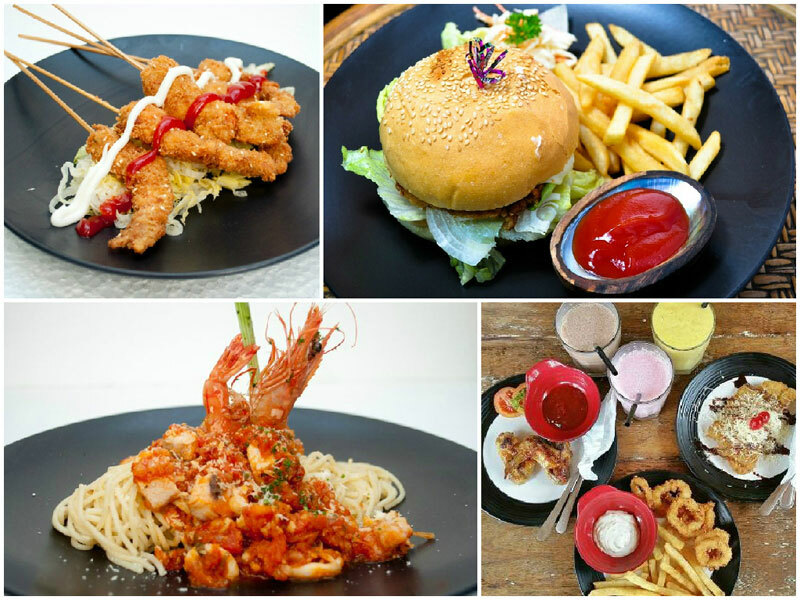 Are there any more awesome family restaurants we missed? Comment and share it with us today! 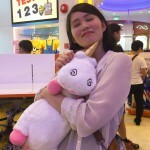 Jiayi's dream is to visit all the castles there are in the world and travel to the most magical places on Earth.